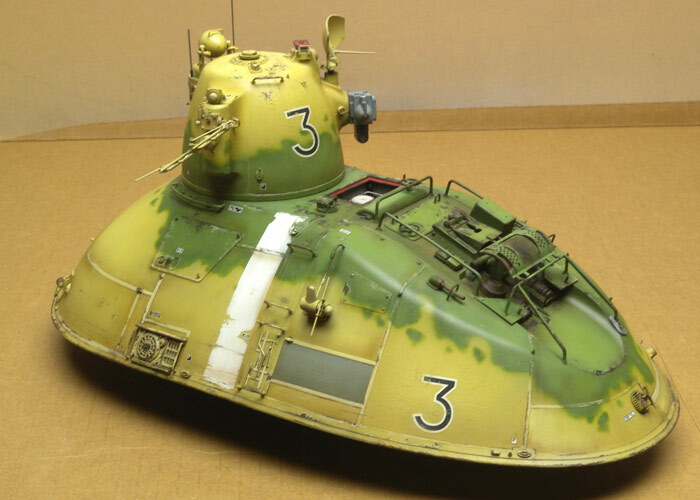 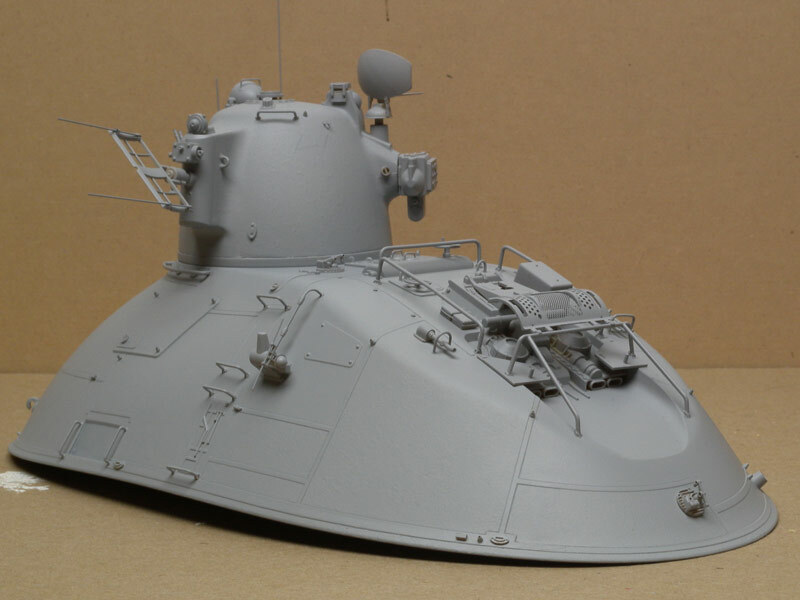 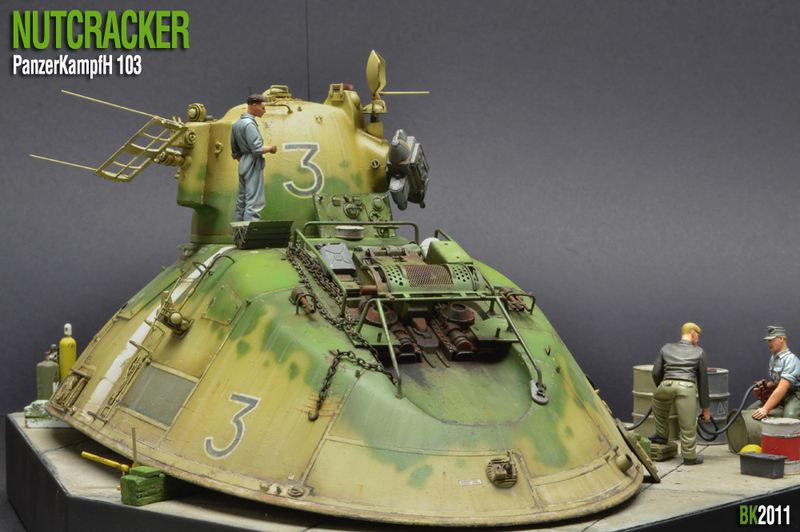 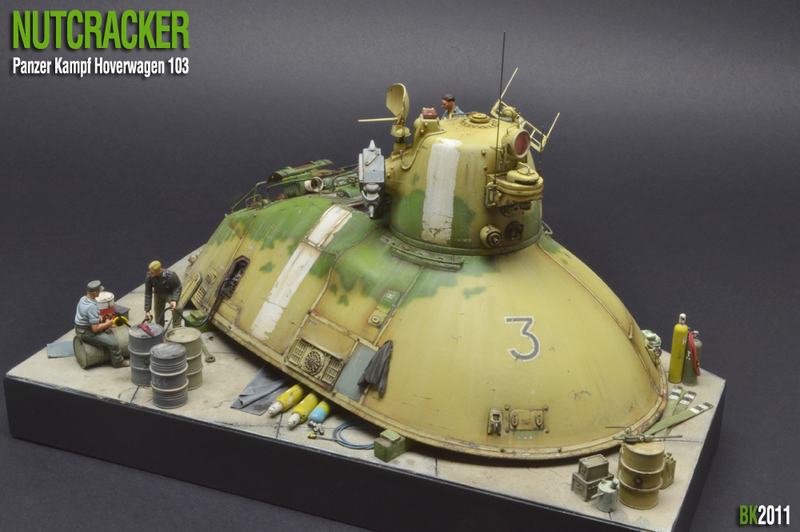 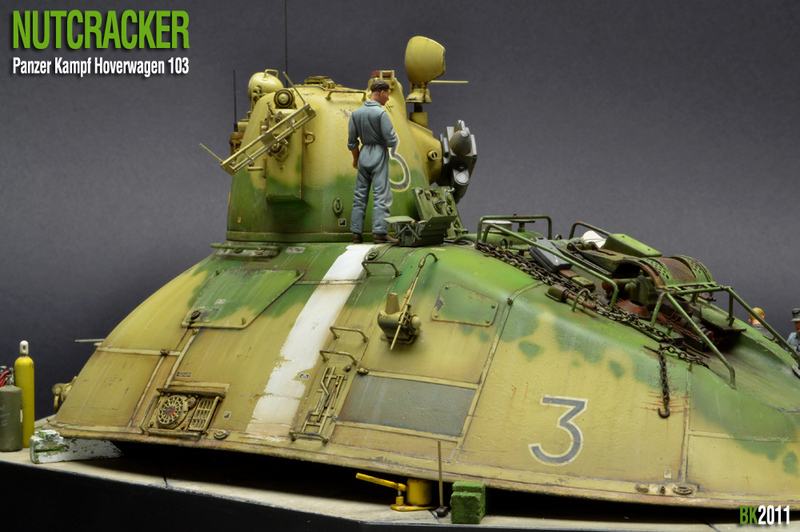 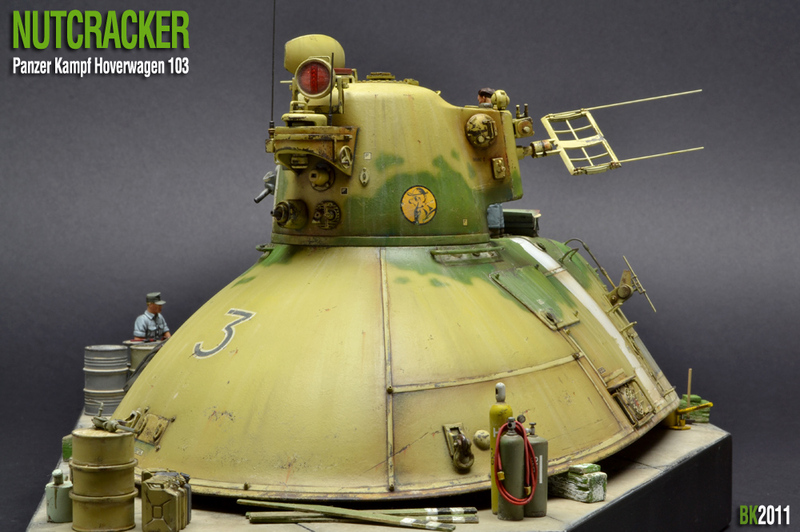 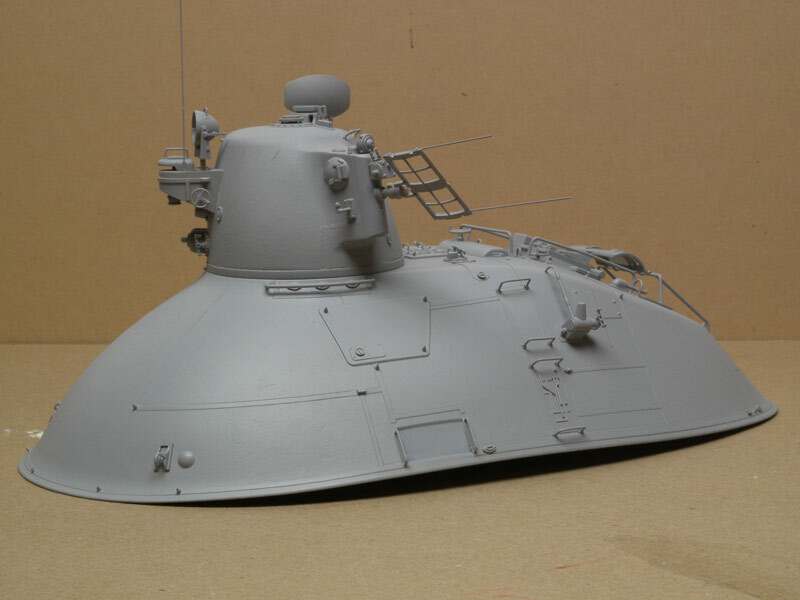 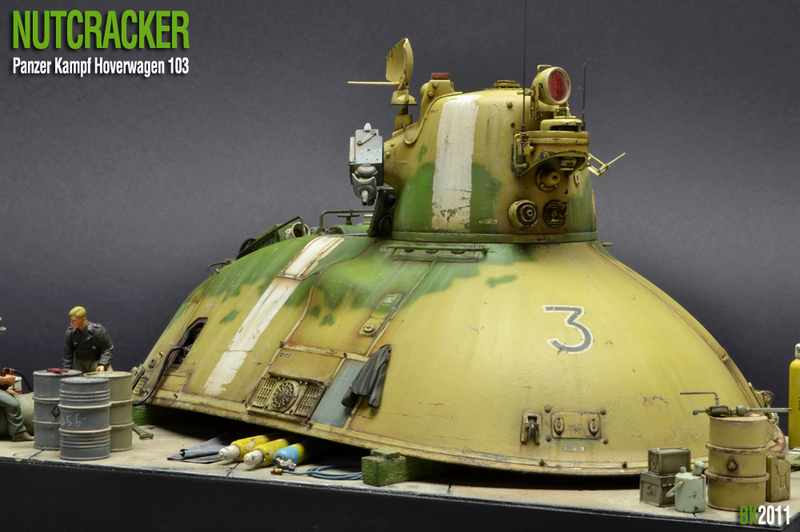 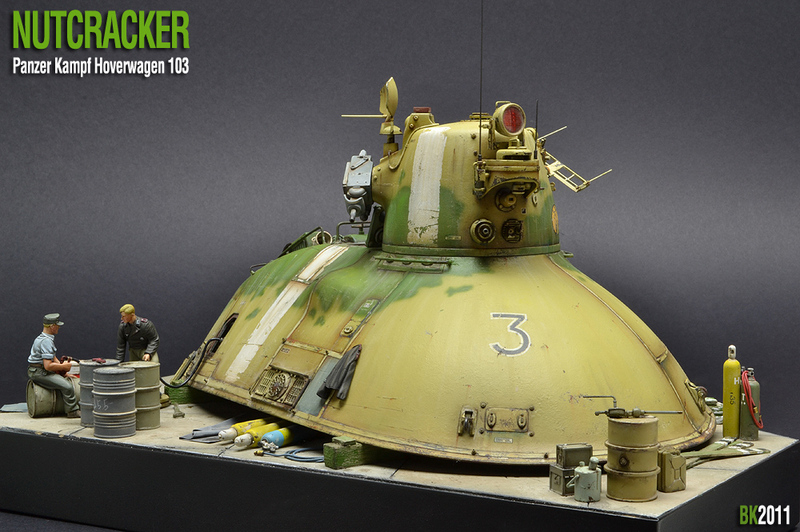 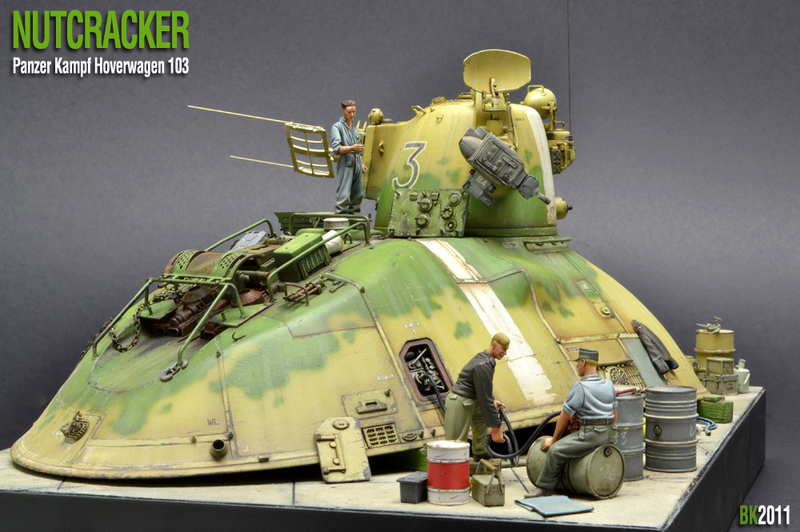 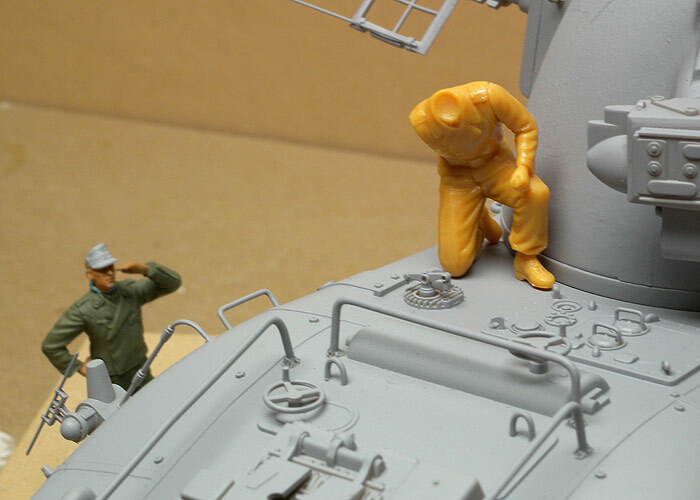 I was very excited when it was announced that Hasegawa was going to release a 1/35 Nutcracker. 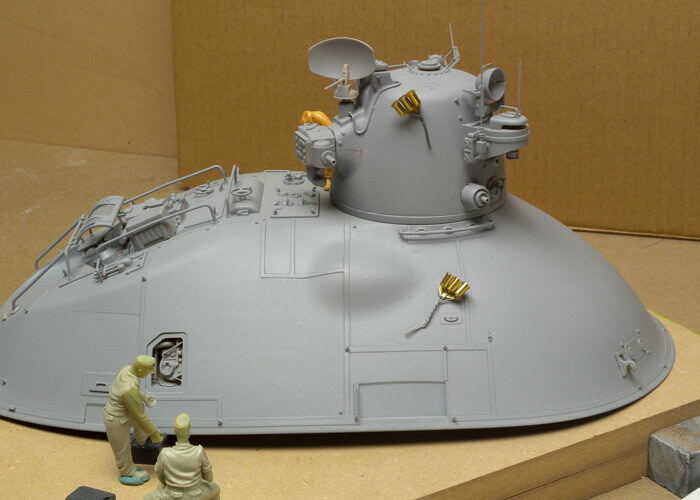 I've been accumulating the donor kits for a scratch built 1/20 version for a while, but the sheer size of the finished model has been deterrent. 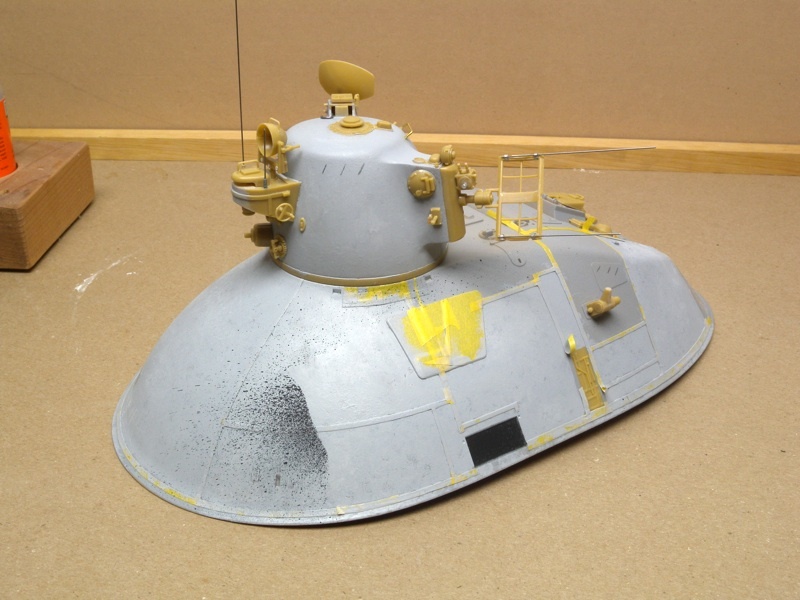 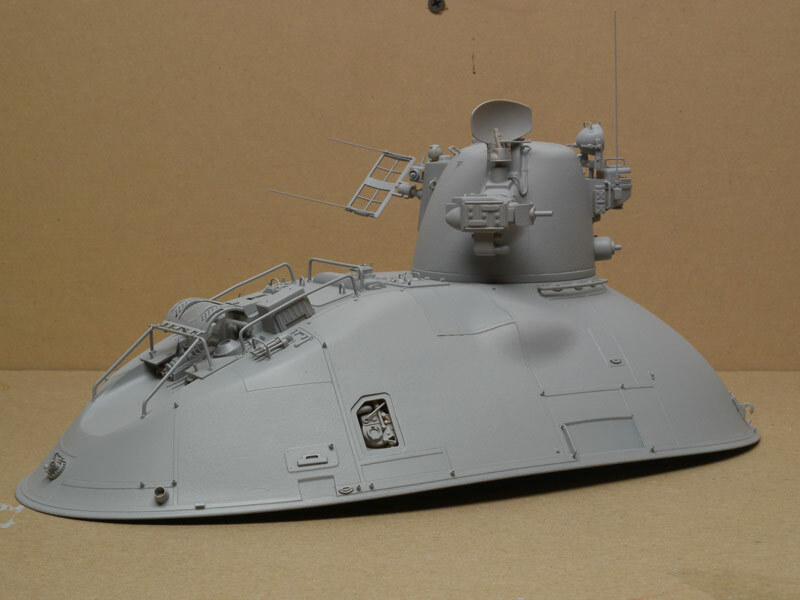 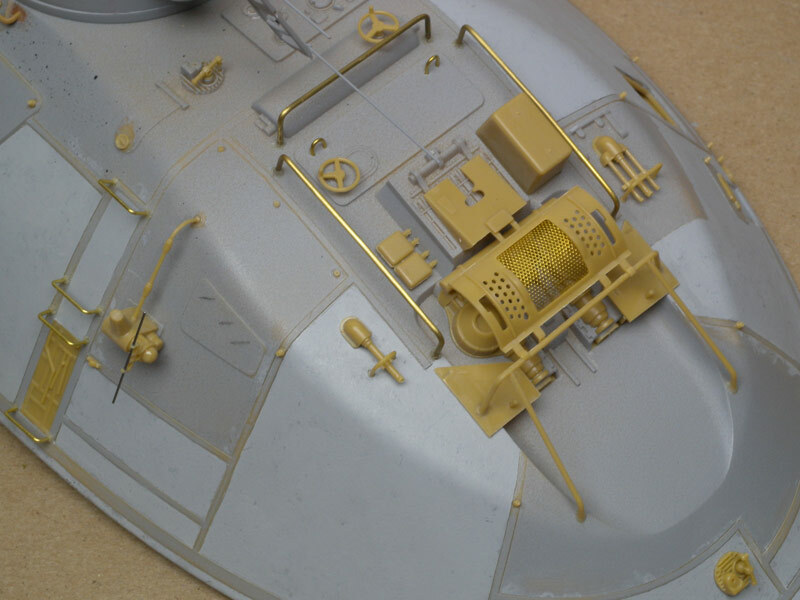 The Hasegawa kit is highly detailed with quite a few tiny parts that will require care when gluing. 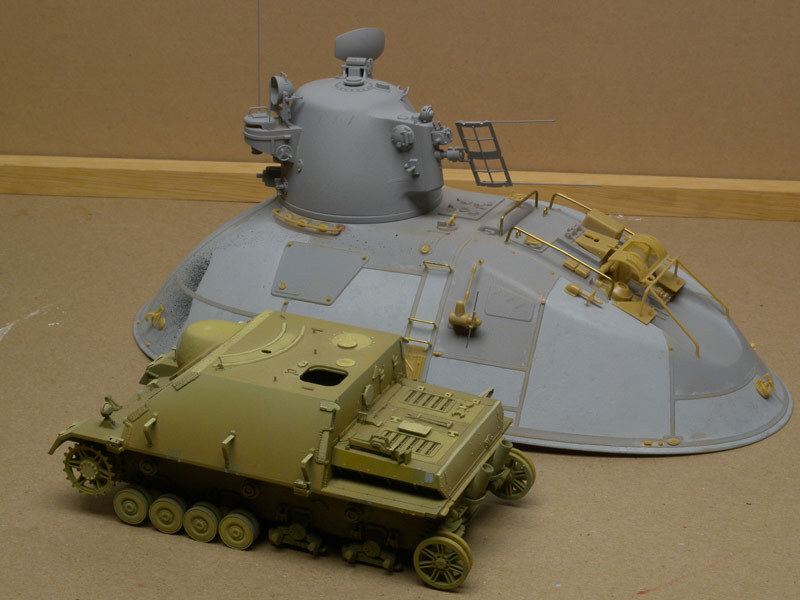 The basic kit builds up very nicely right out of the box, but I added a few minor details to the basic build and created an in-service diorame to help depict the size of the thing. 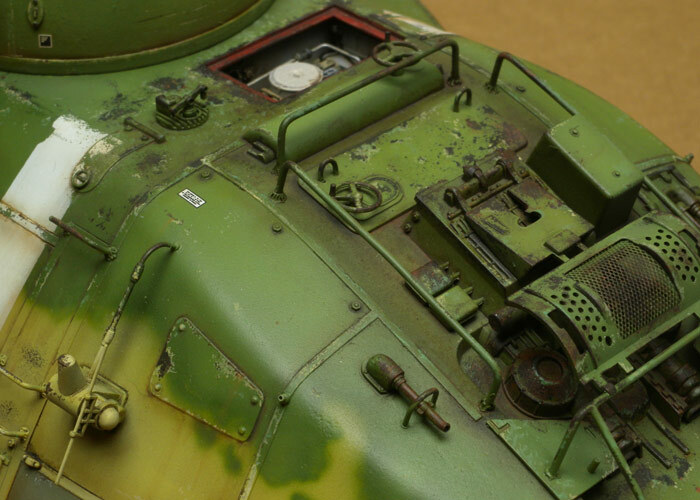 I had a lot of fun with all the 1/35 detail bits. 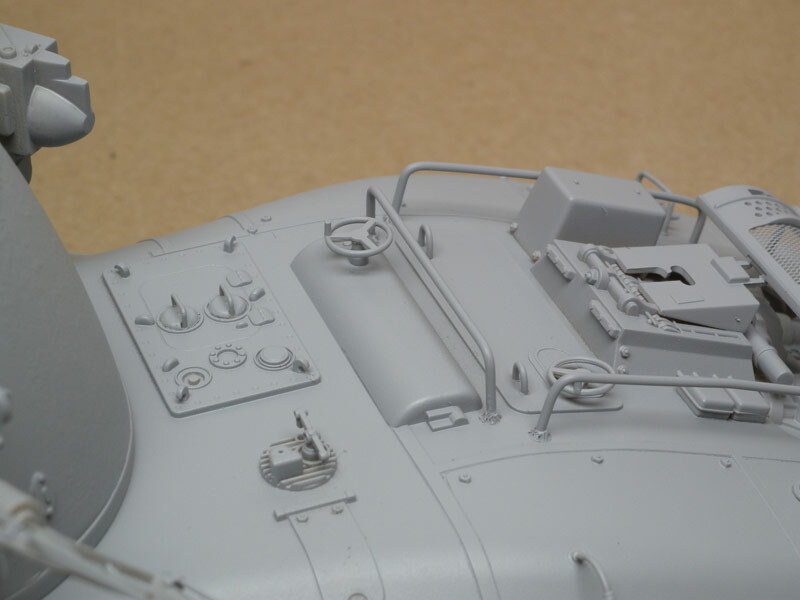 It was so easy to add parts here and there. 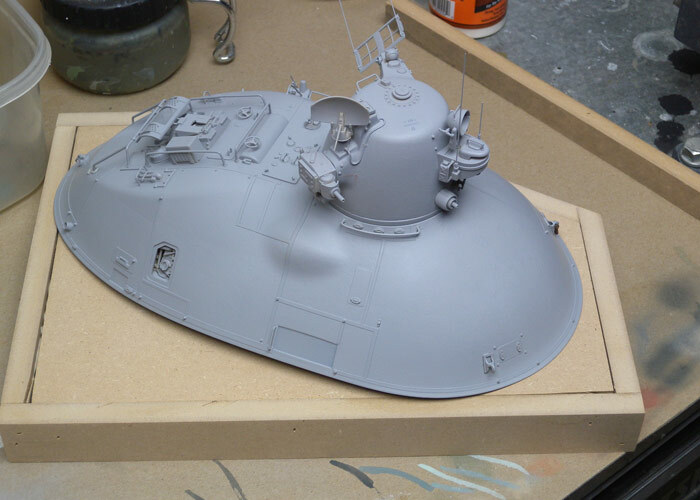 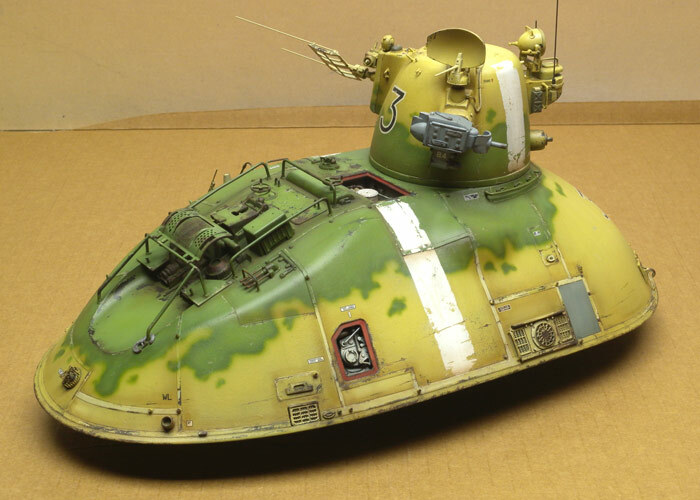 In 1/20 scale, almost of that would have to be scratchbuilt. 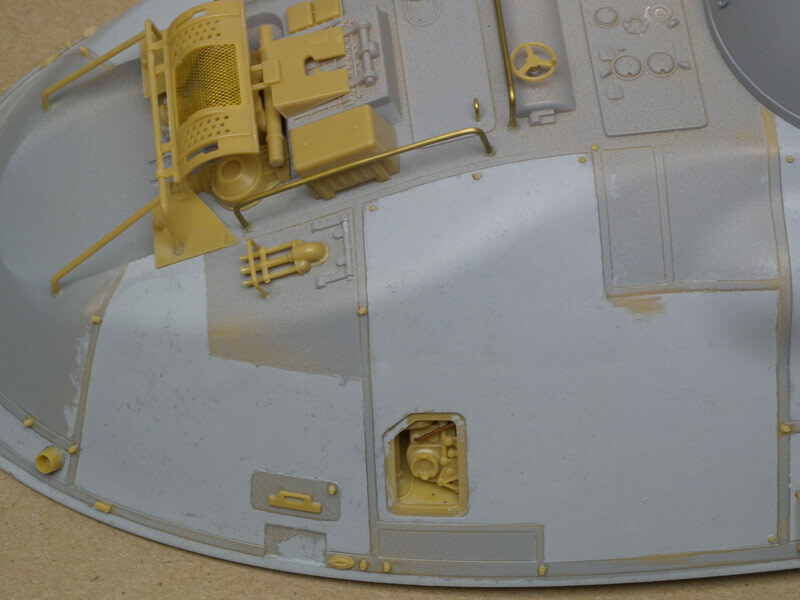 I took a few photos for a review but figured while I was out in the garage, I would hit it with a shot of primer to see how noticeable those "sink marks" were. 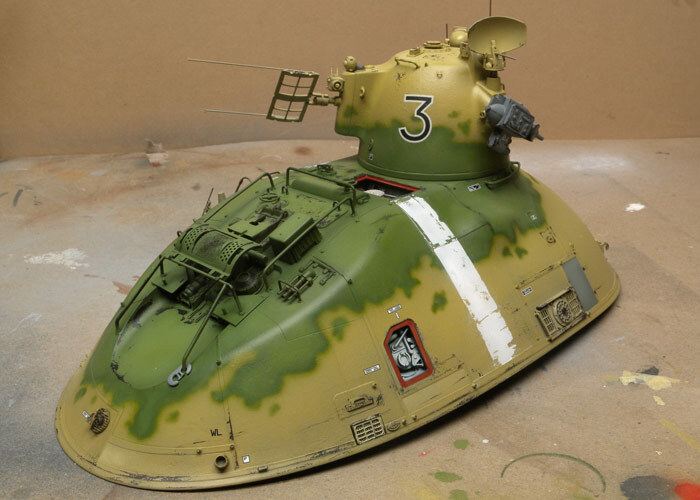 Bad enough for me that I had to do something about it. 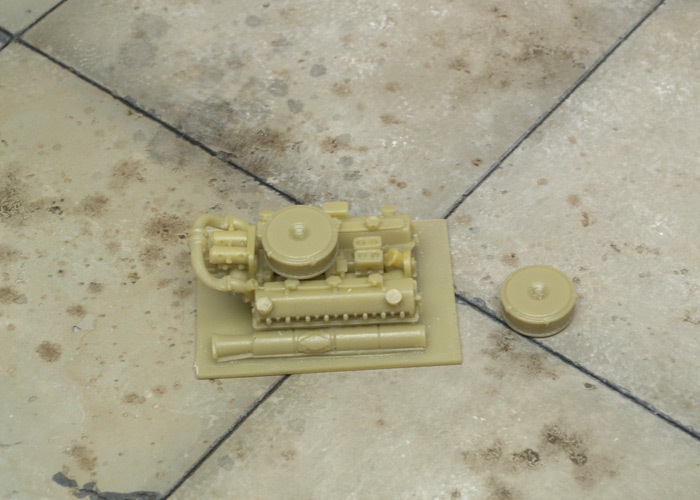 I filled them in with several applications of Mr Surfacer 500. 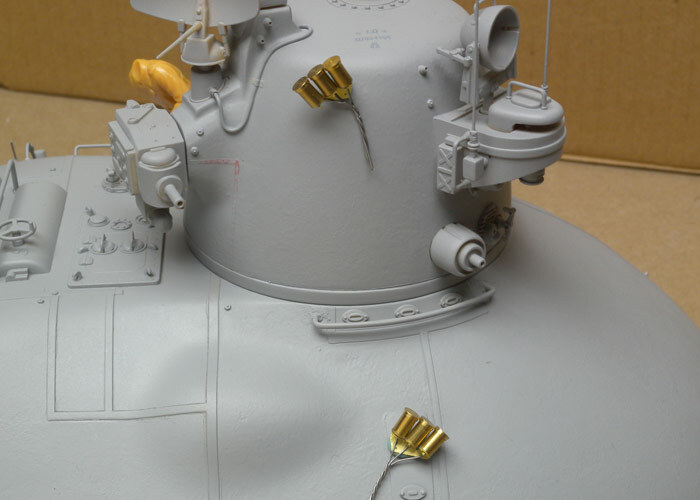 The "sink marks" are suppose to be there from what I hear. 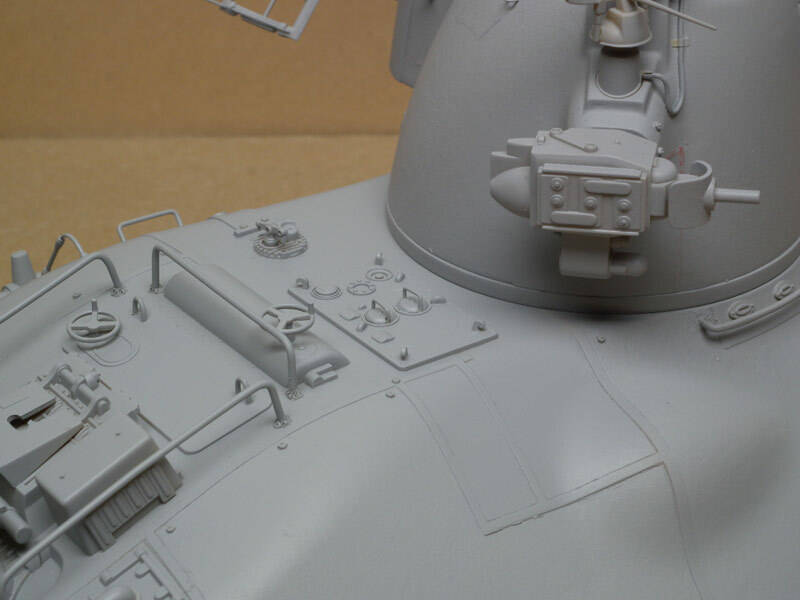 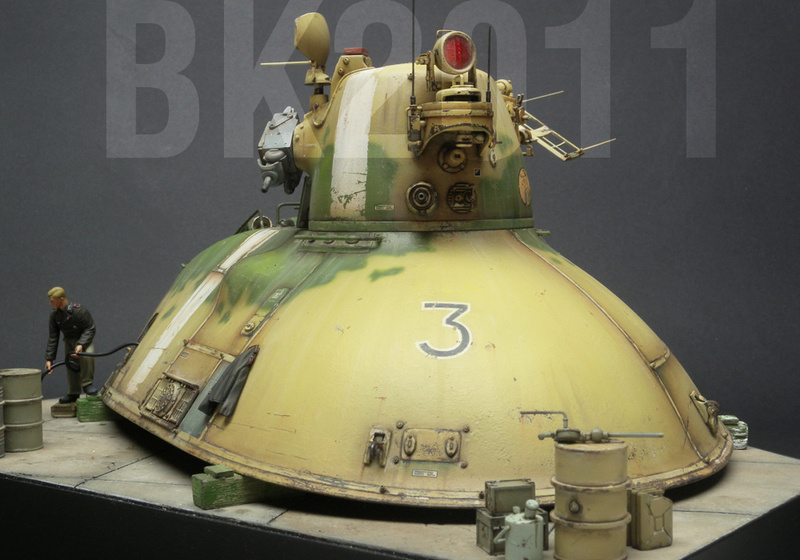 They represent the panel shading Kow applied to the original 1/20 build. 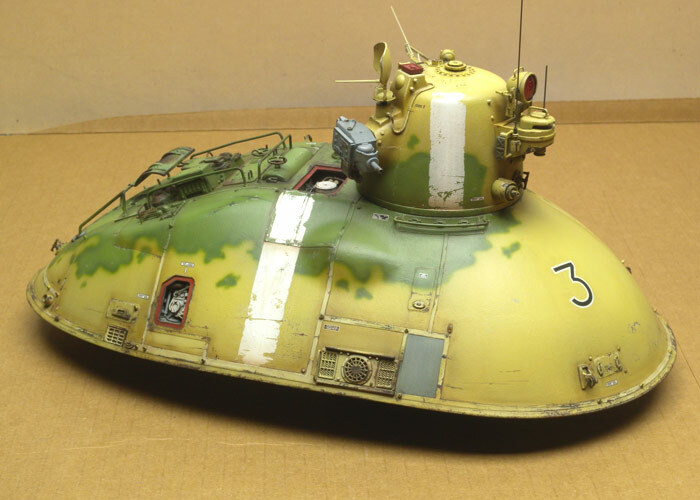 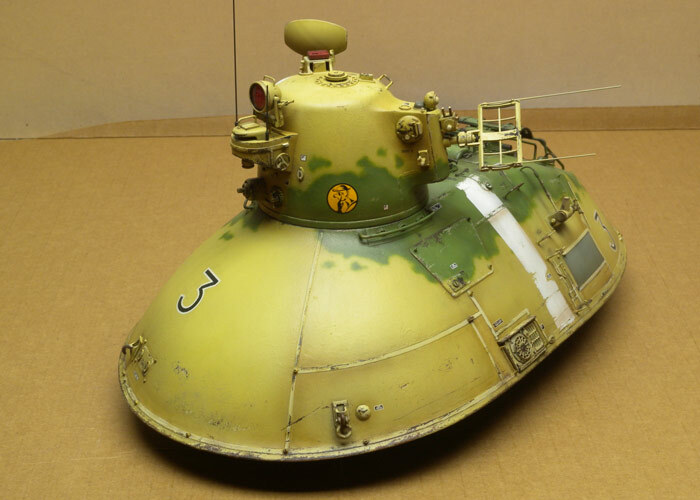 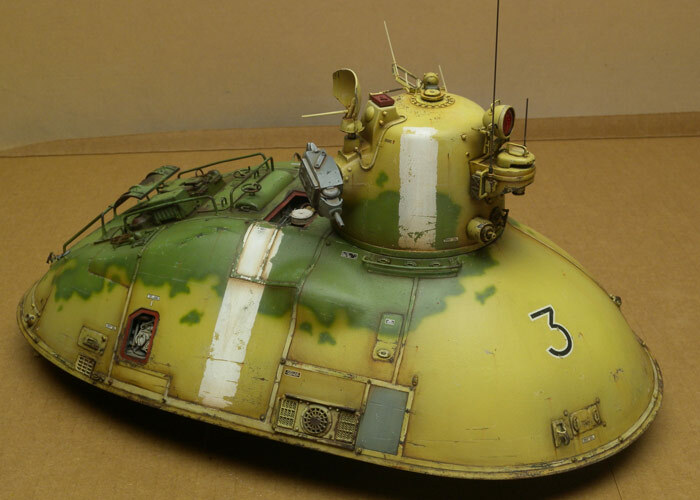 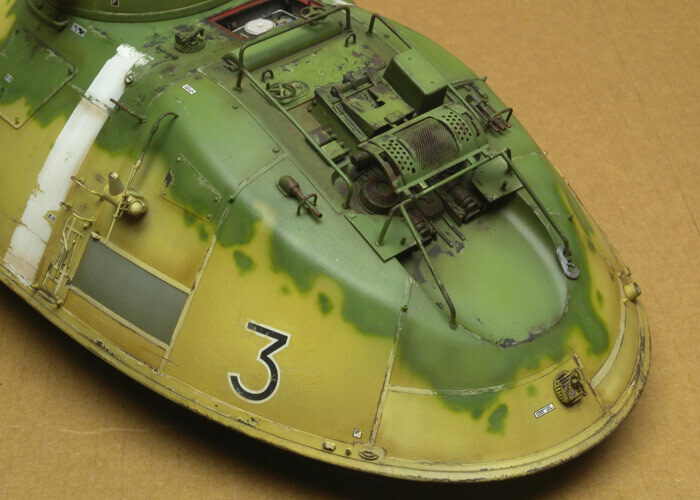 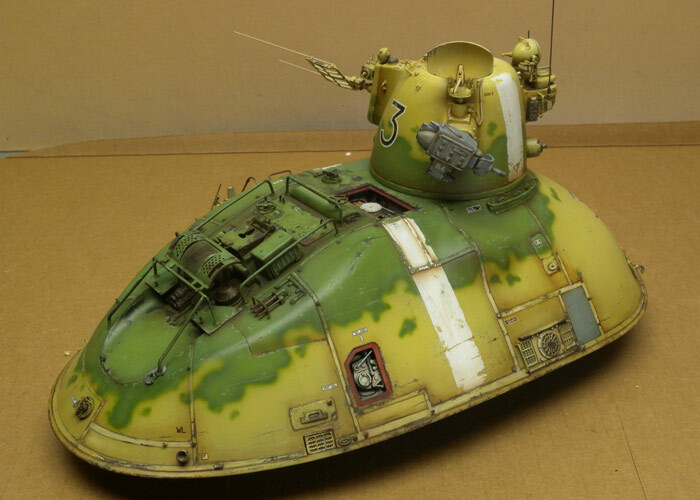 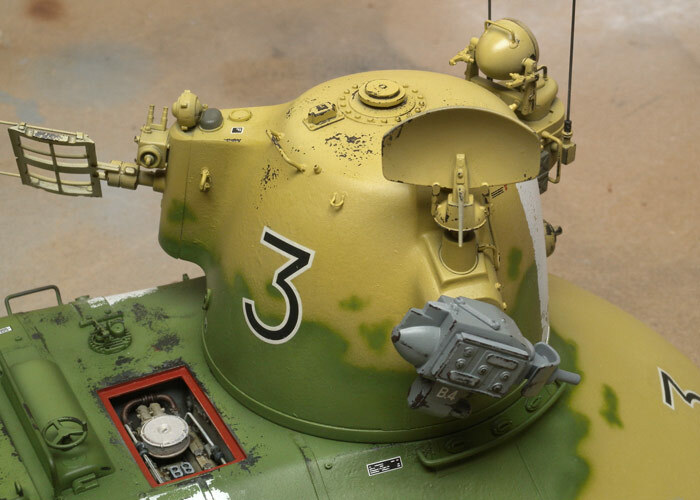 Personally I think they are a little heavy handed in 1/35 and look like unintentional sink marks. 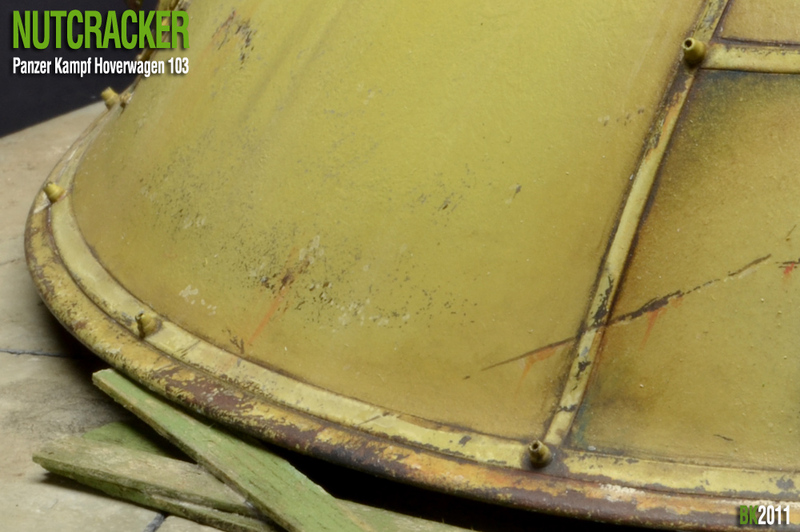 Before any major assembly, the hull was textured with Mr. Surfacer 500 dabbed on with a stunted flat brush. 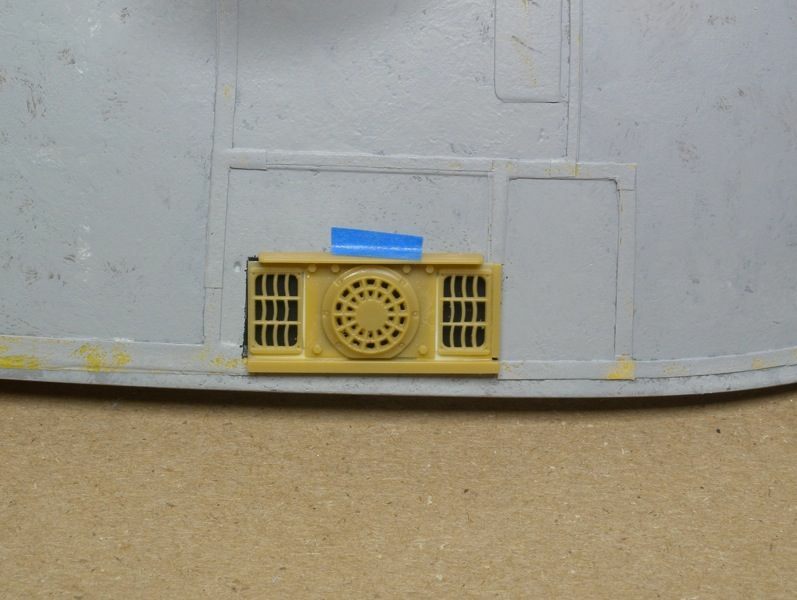 I ground out the back of some of the air vents and added aluminum mesh to add some details. 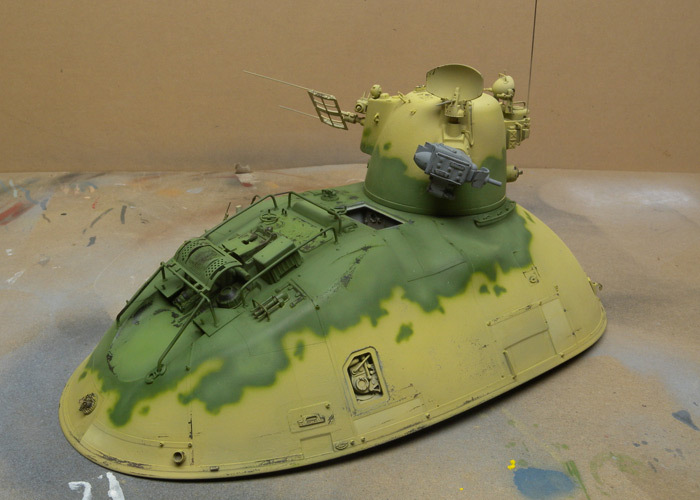 I didn't add anything behind the parts but painted areas black. 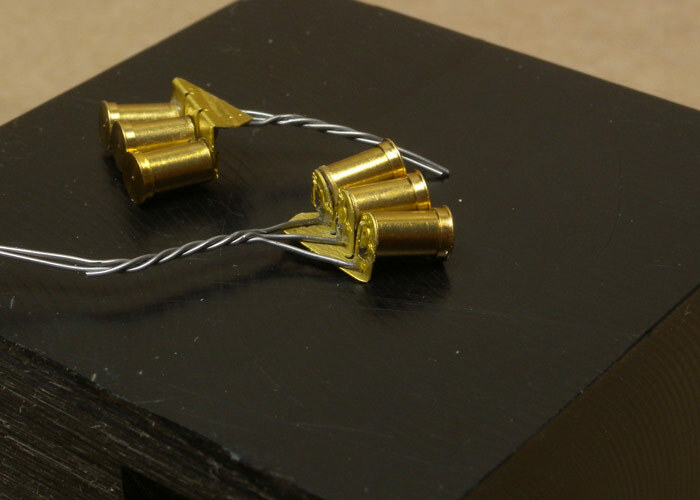 I also replaced a few of the plastic antennas with music wire. 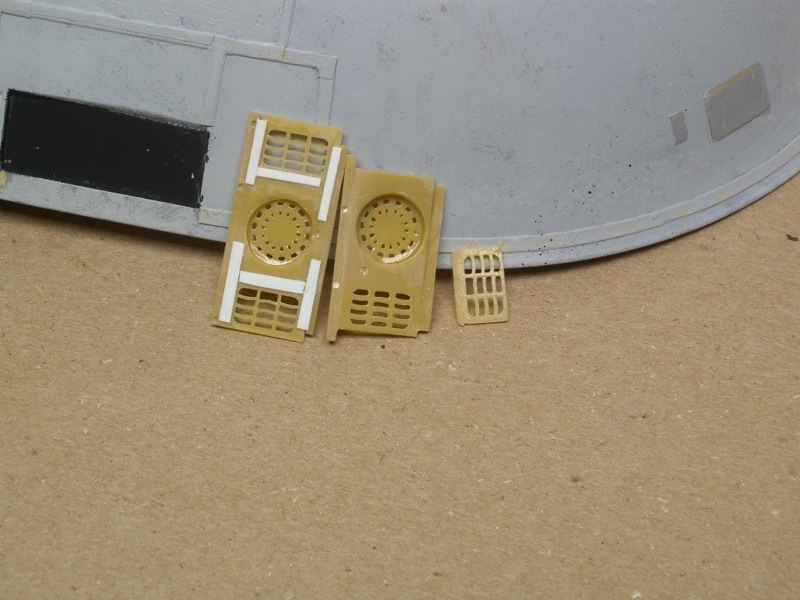 I've bonked into these enough that I am glad I did because plastic ones would have broken by now. 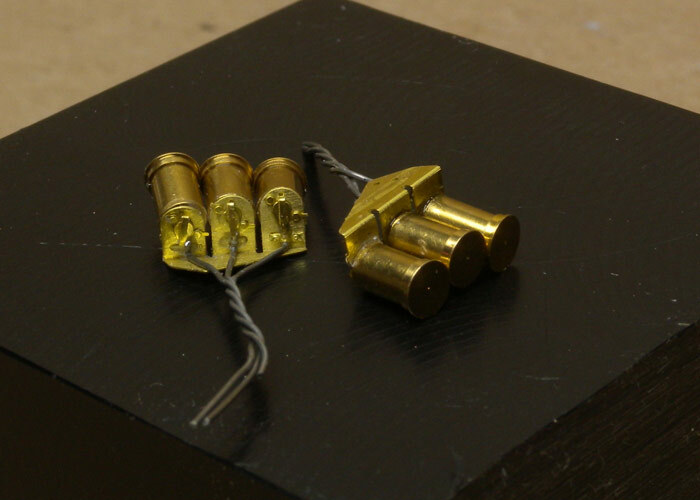 I also replaced a few of the grab handles with brass wire because it was easier than cleaning up the seam on some of them. 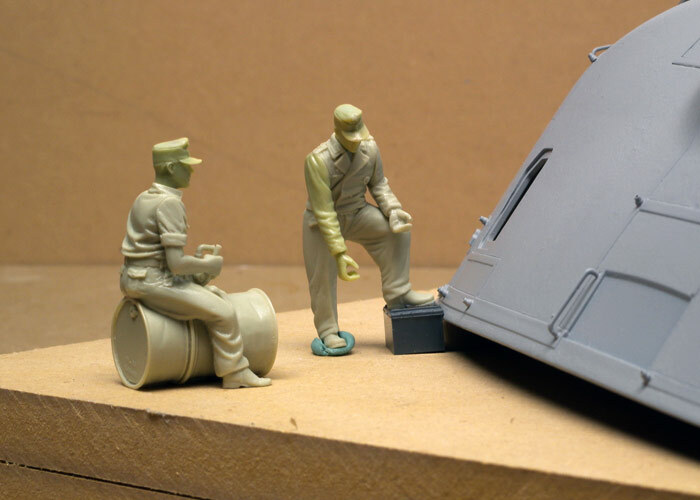 Once the model was assembled it received an overall coat of gray primer and was set aside while I worked on the figures I have gathered for the maintenance scene I had planned. 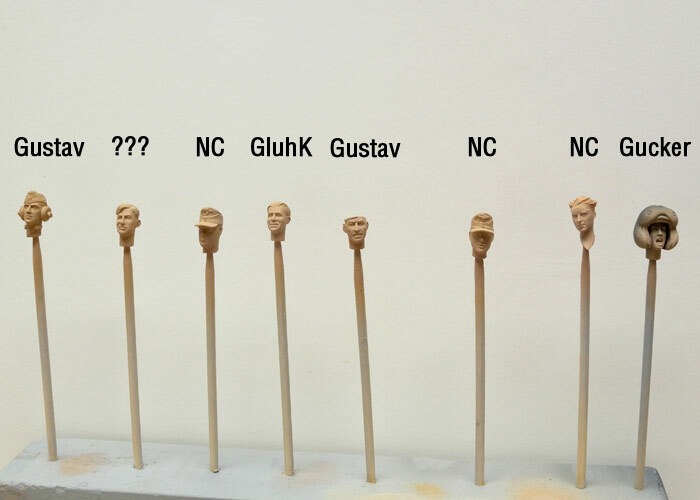 The figures are a mixture of Royal Model and Corpus. 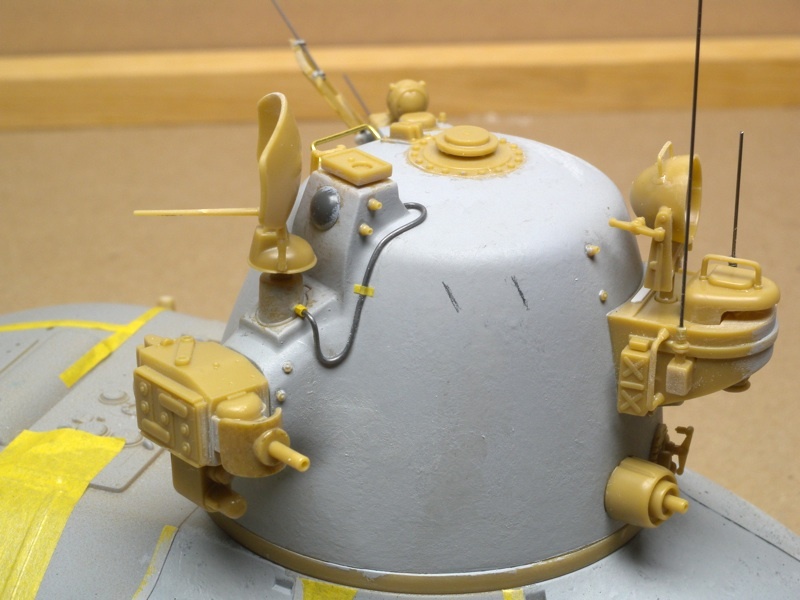 I replaced one of the heads with a resin one from Hornet. 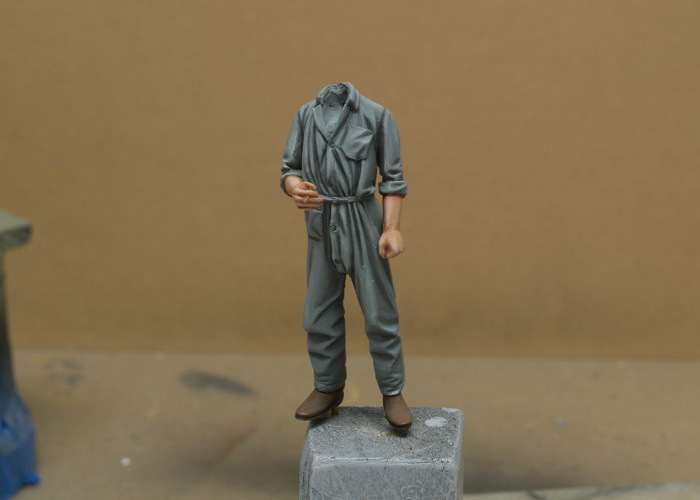 The figure were a little bit of a challenge because it has been so long since I worked in 1/35 scale like this, much less painting multiple full figures. 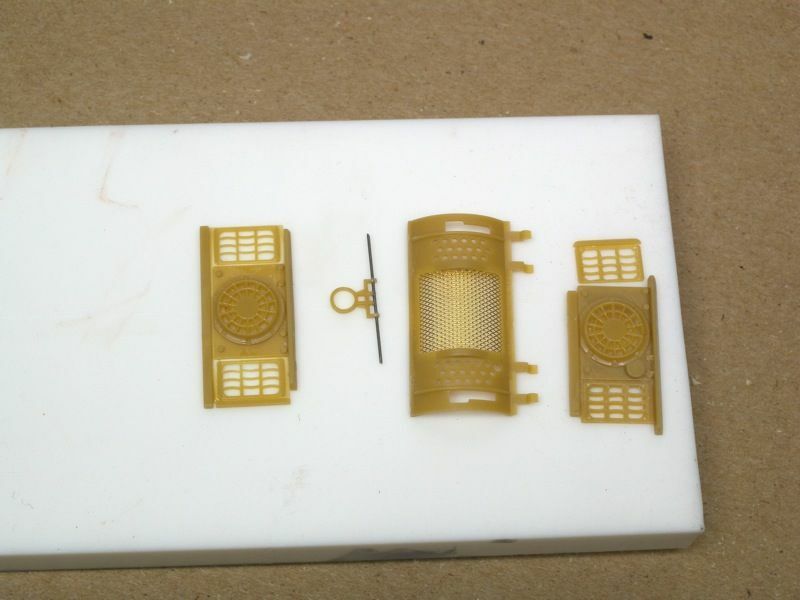 I also added screen to the side vents and toyed with the idea of brass smoke launchers but decided not to use them. 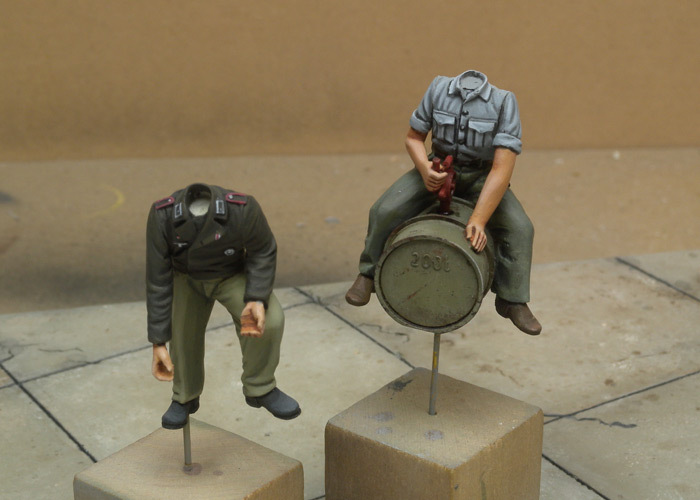 I fashioned a simple base from MDF and made some progress on the figures. 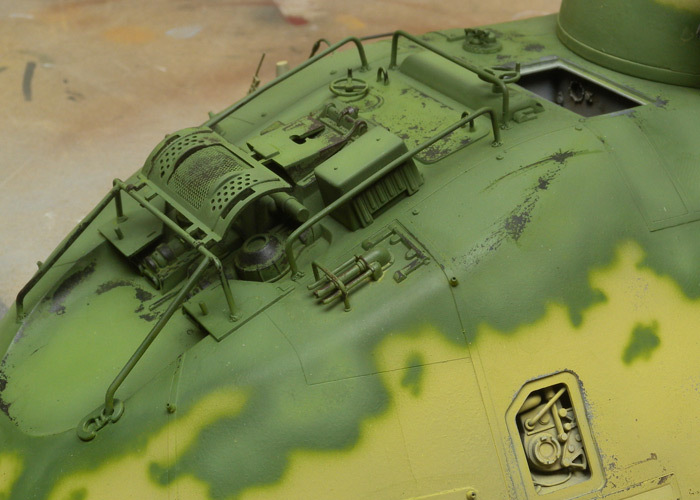 The colors are close to WWII German uniforms, but I wasn't trying to match any particular shade of green or anything. 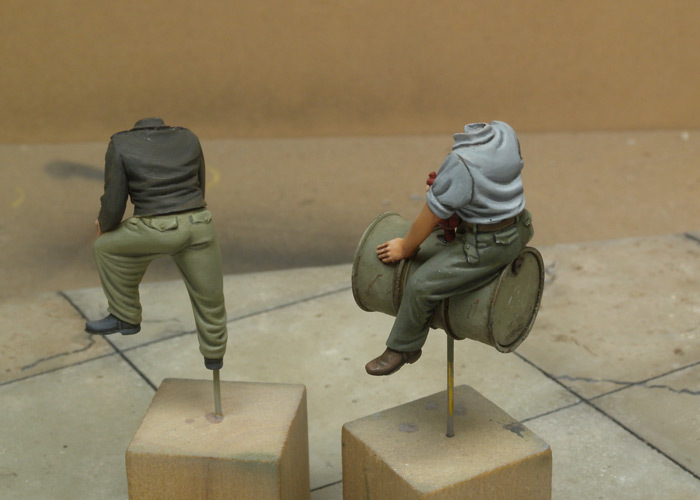 The figures are painted entirely with Vallejo Acrylics. 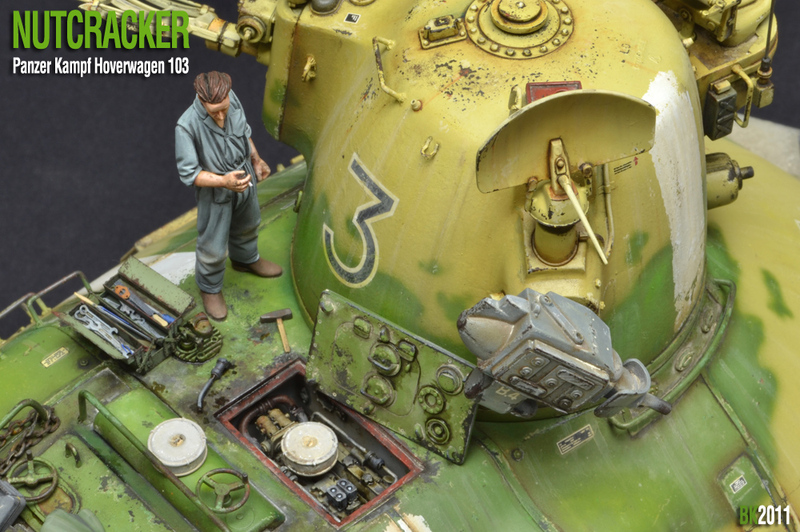 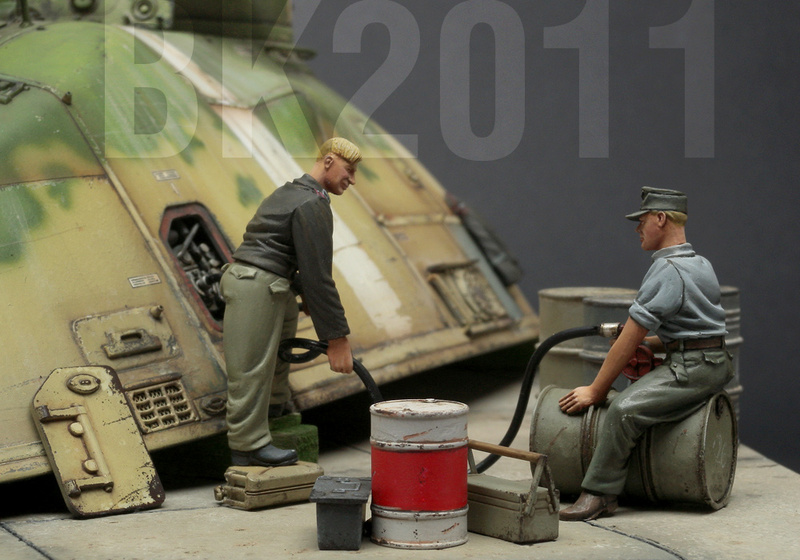 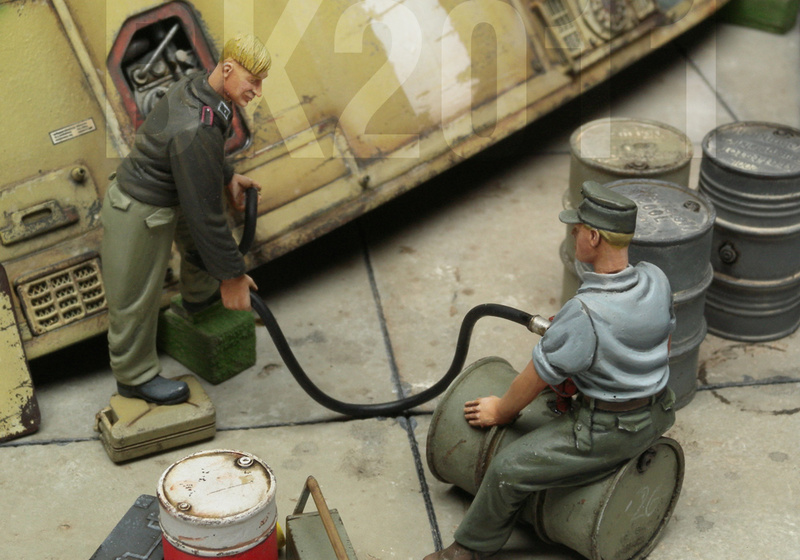 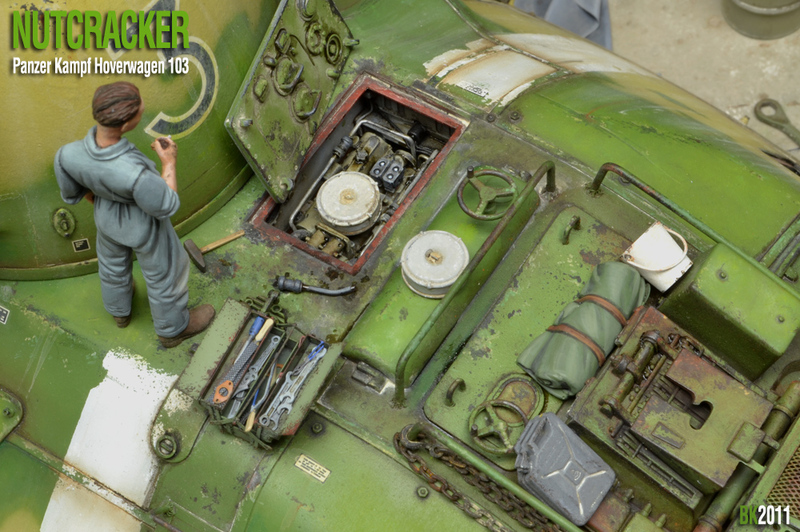 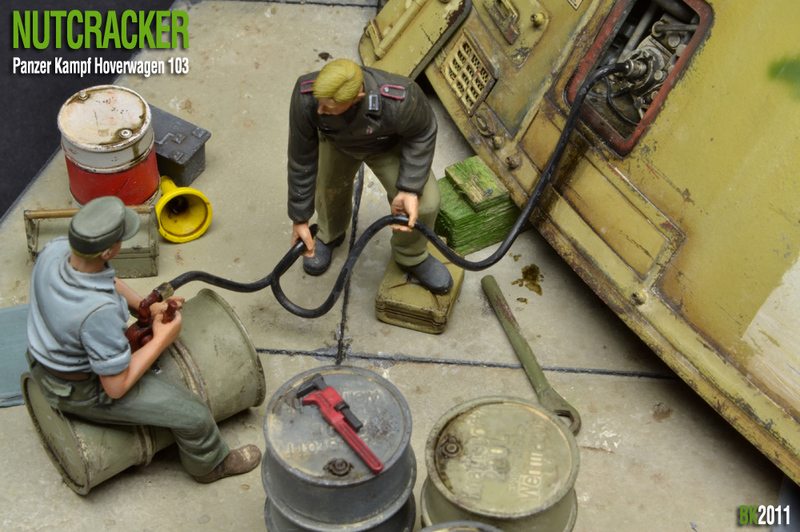 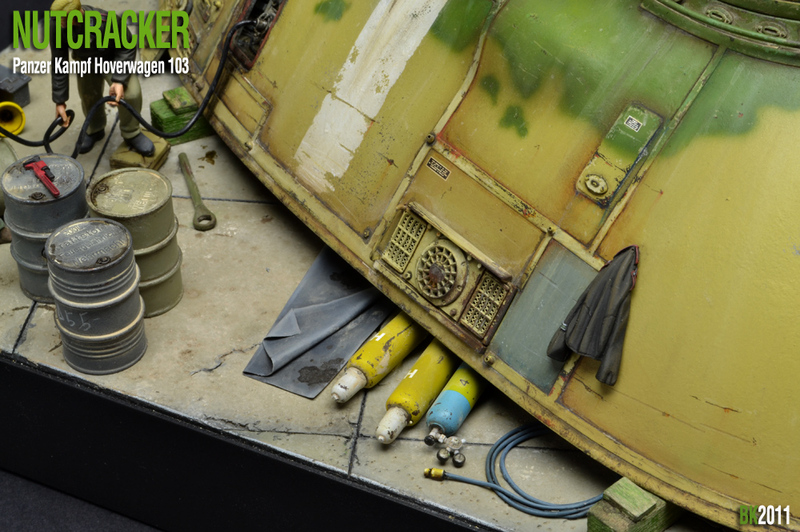 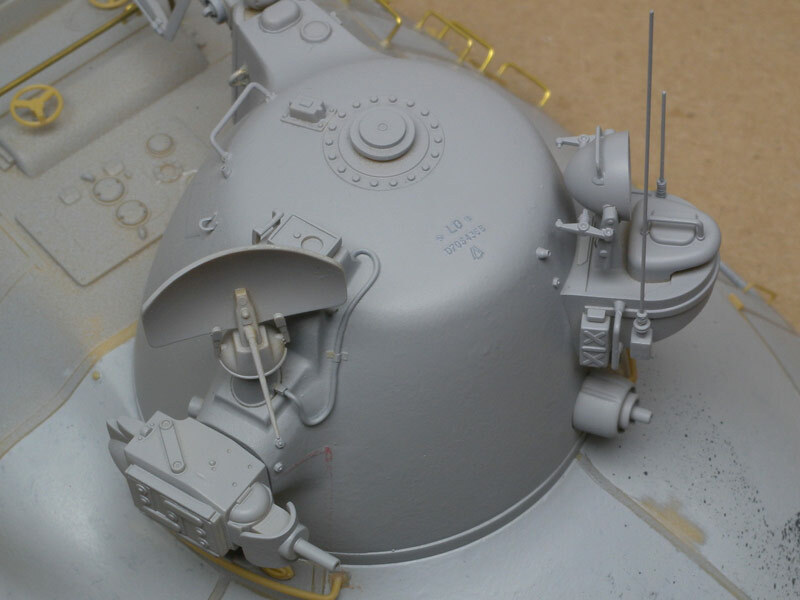 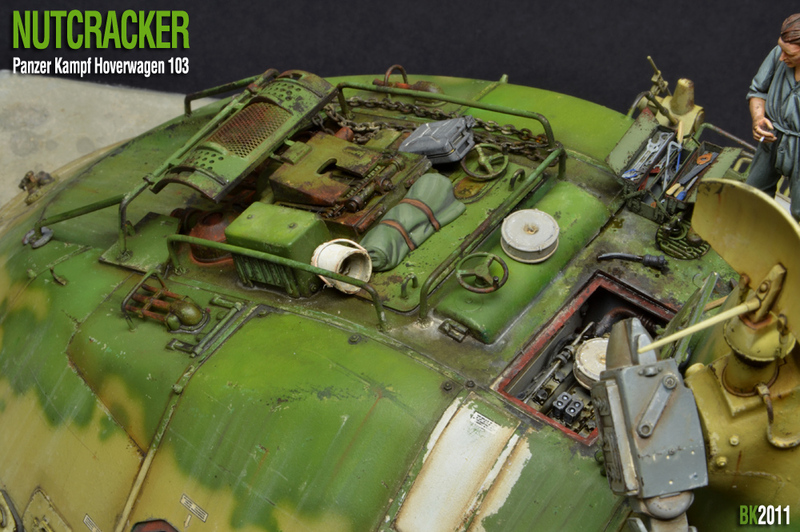 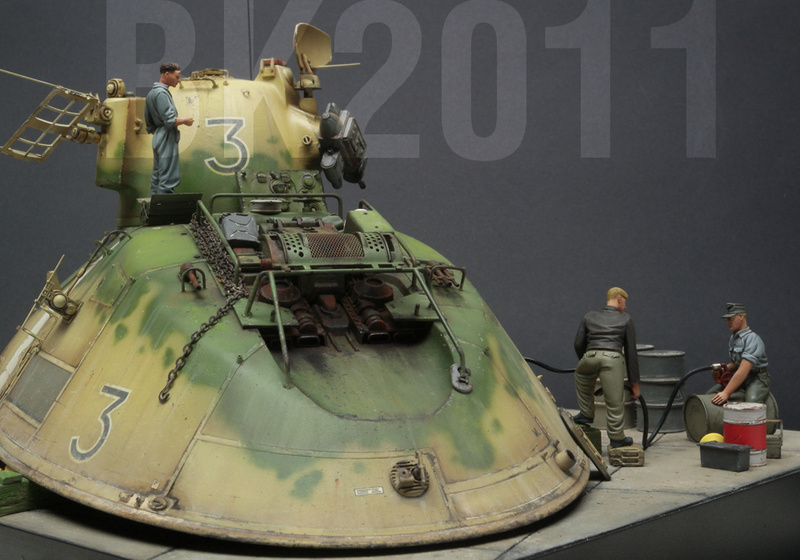 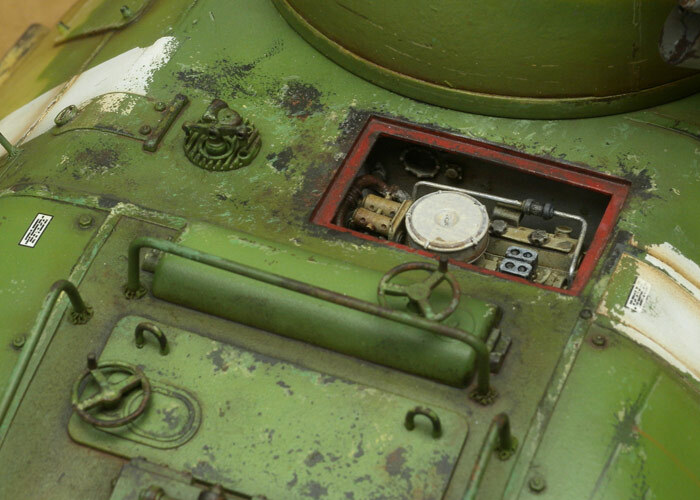 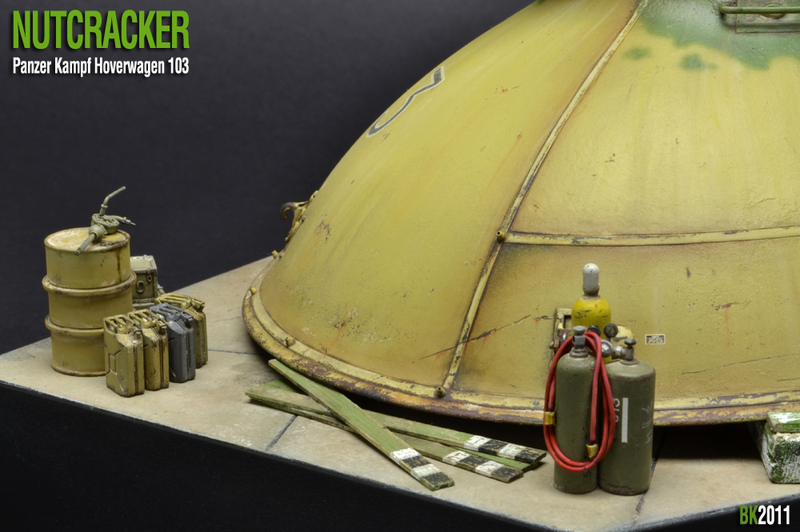 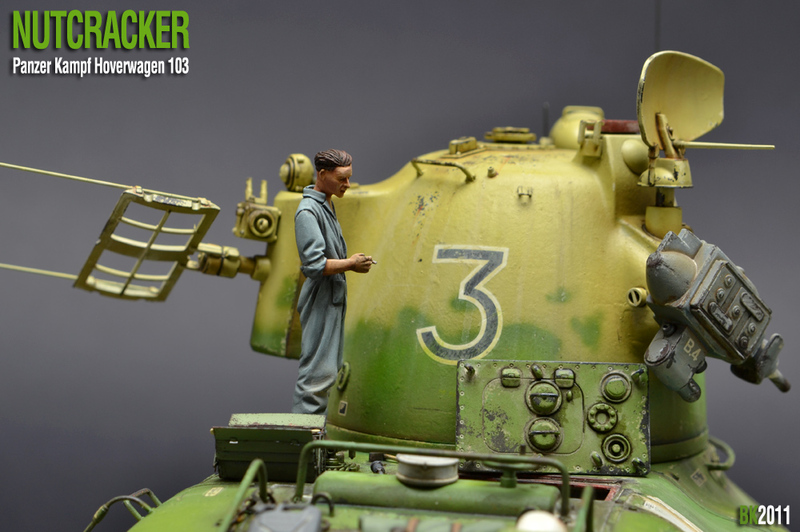 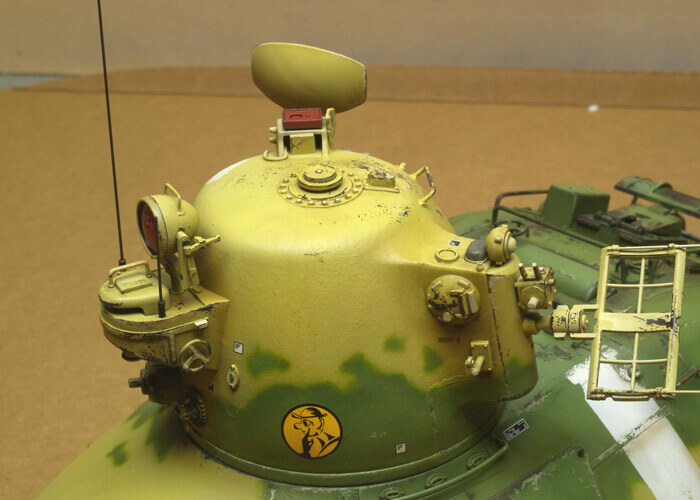 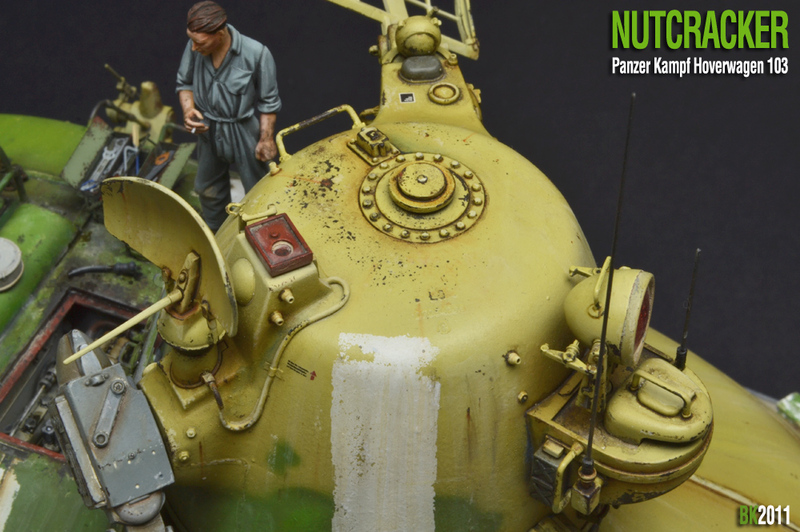 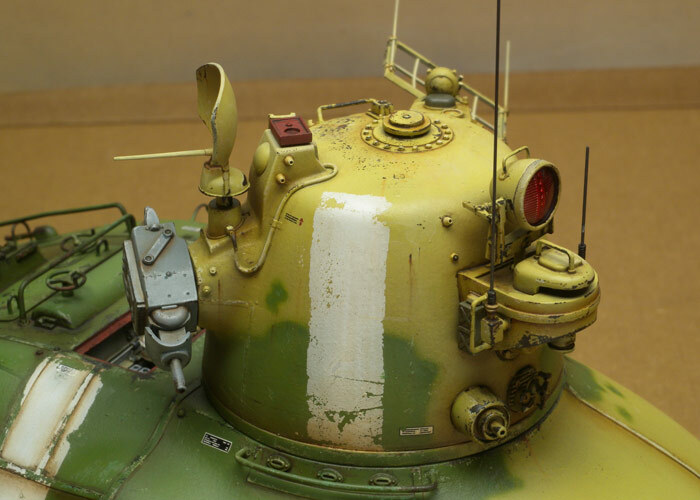 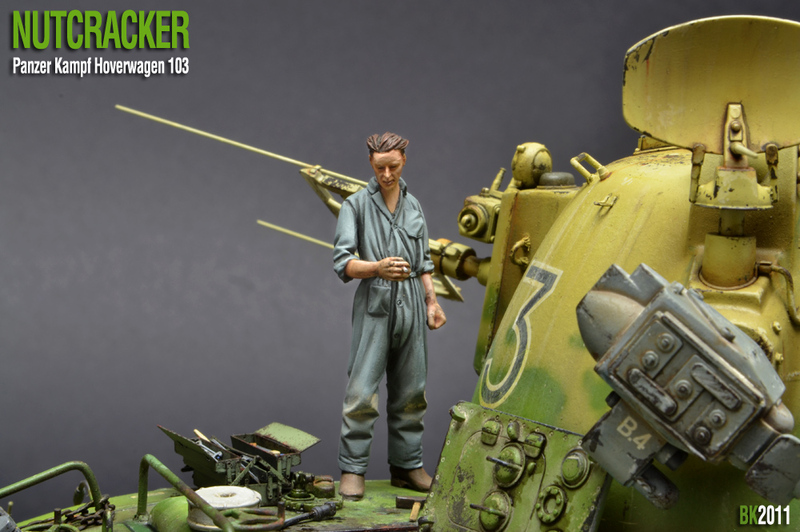 The quality of the sculpts made painting very easy, especially small details like the insignia on the tanker jacket. 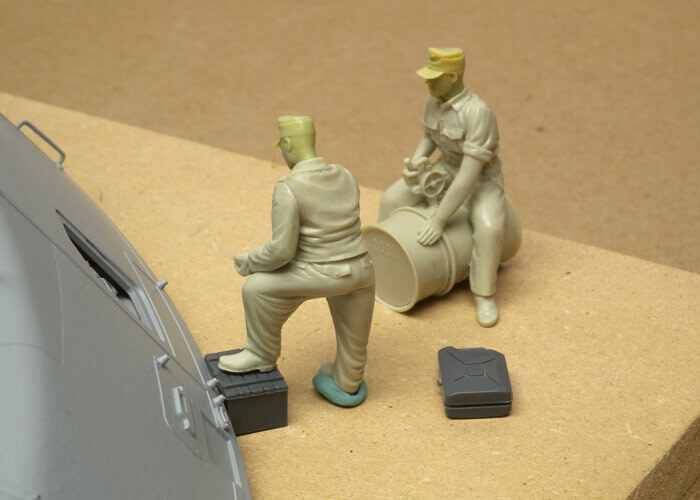 At some point I decided I needed to open a hatch for the mechanic to be working on. 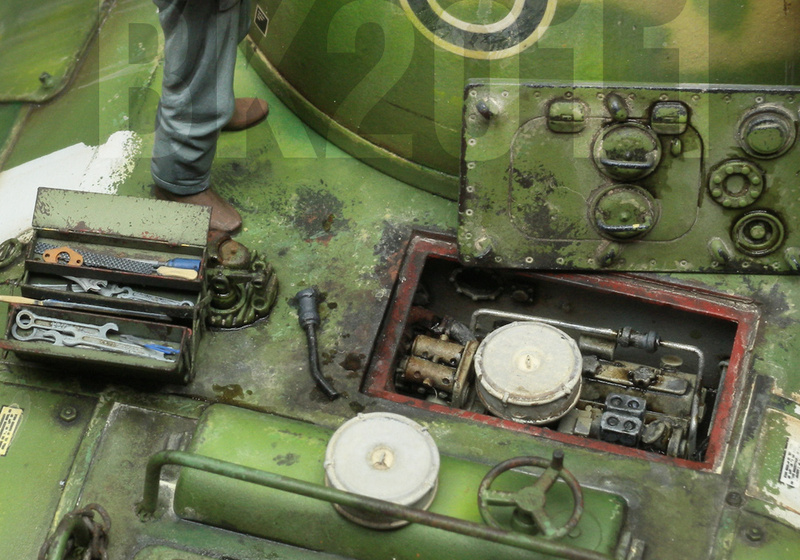 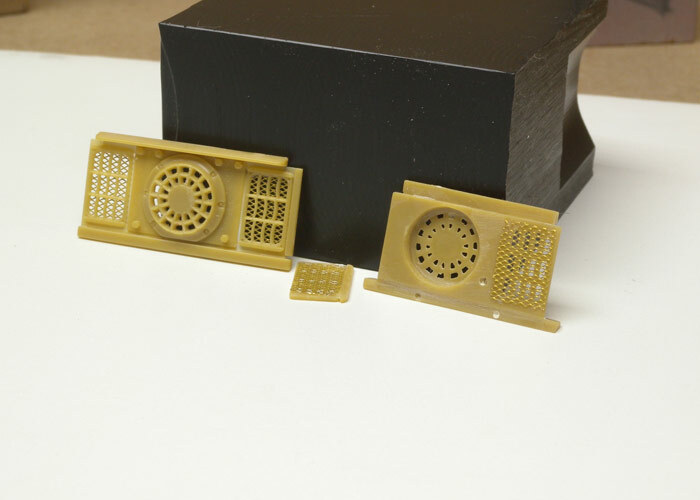 I carefully cut out one of the upper deck hatches and installed a resin 1/48 Tiger 1 engine from Verlinden. 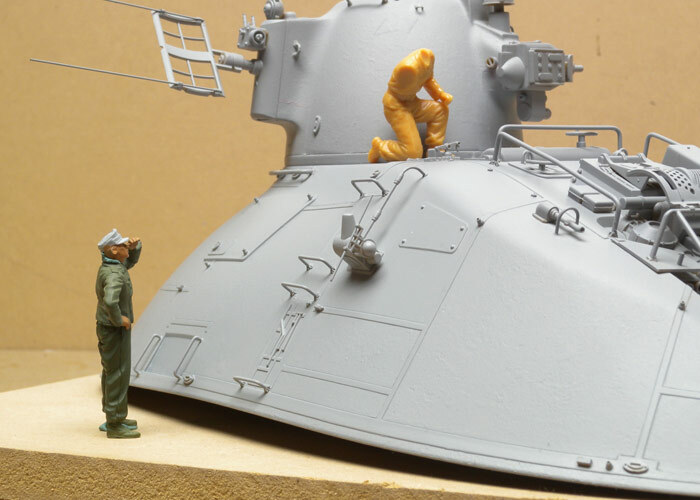 Great details for the size. 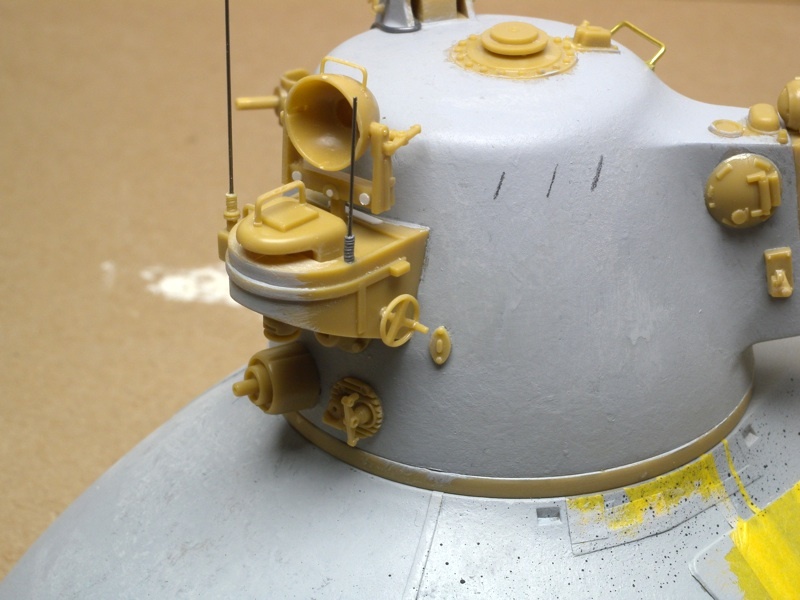 I sealed the top coat with a couple more coats of clear Satin once I was satisfied with the amount of chipping. 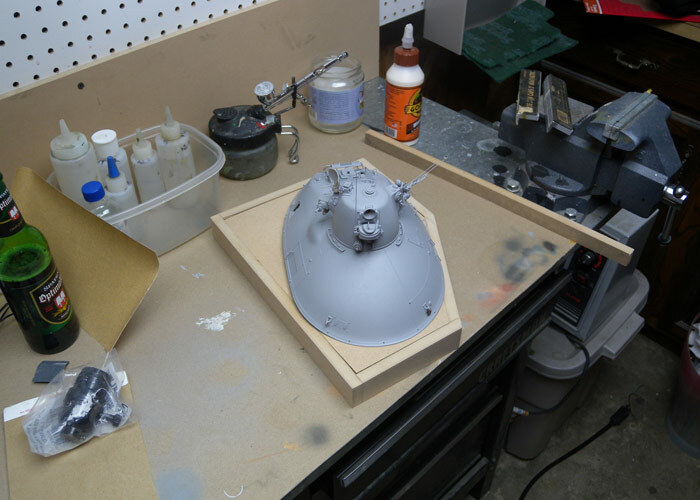 I masked off for the white stripes, airbrushed a couple of passes of hair spray, let dry, and airbrushed Tamiya white. 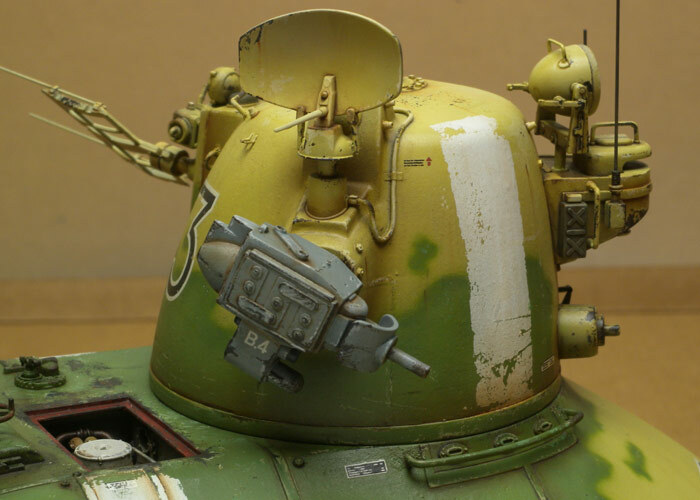 When this had dried to the touch, I again used paint brushes wet with water and a toothpick to wear off the white bands. 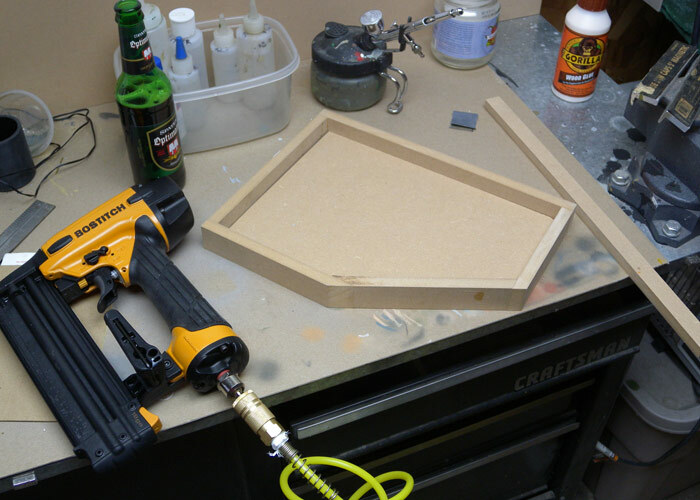 When this had properly dried, I applied one last coat of clear Satin. 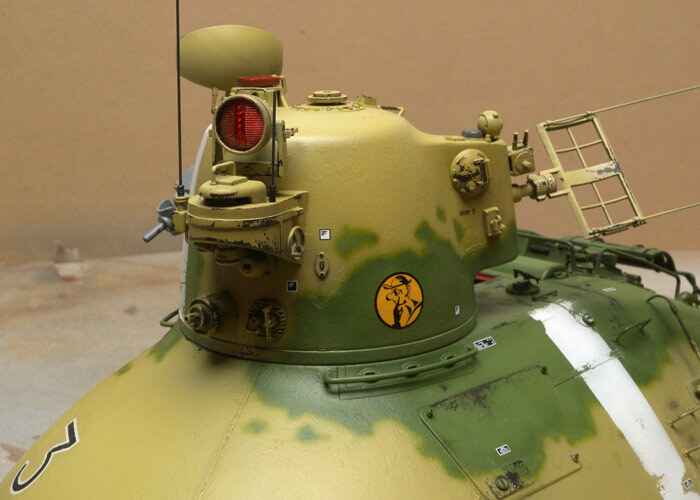 The decals were next. 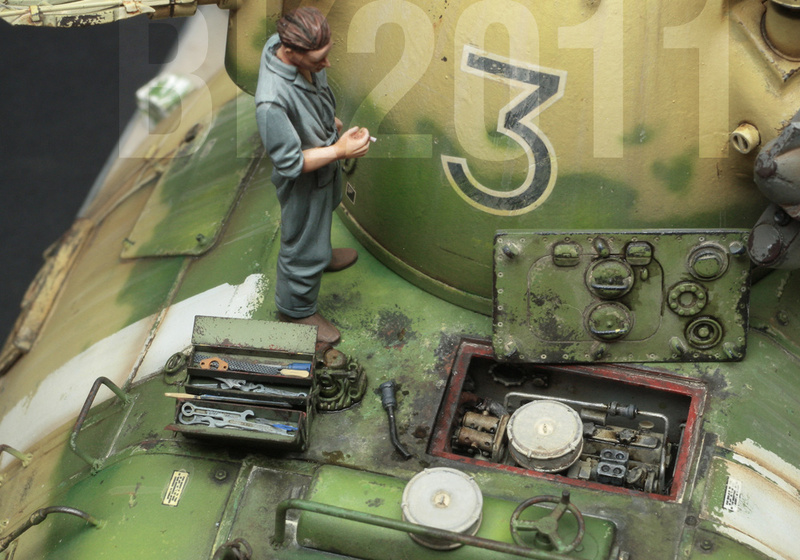 I liked the large number 3 but didn't think the white outline had enough contrast. 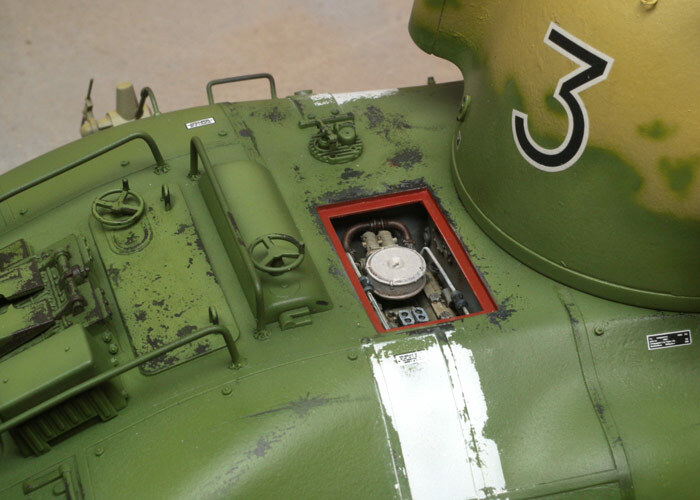 I cut a slightly smaller offset version of the 3 and used these to mask off and airbrush a black 3. 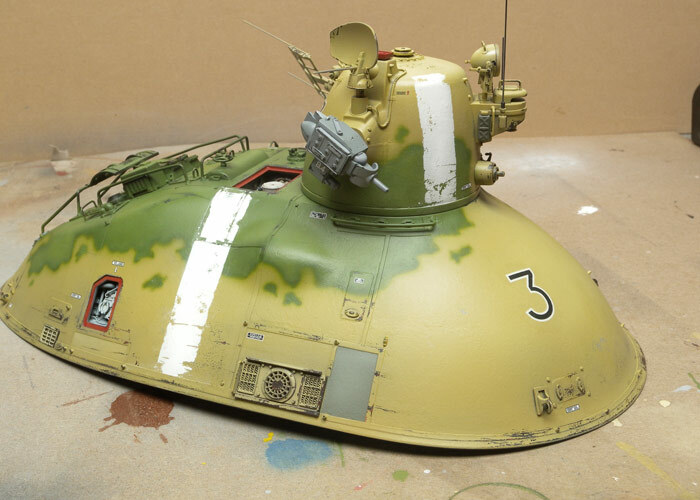 I removed the masks, hand painted Future clear over the black 3 and anywhere else I might want a decal. 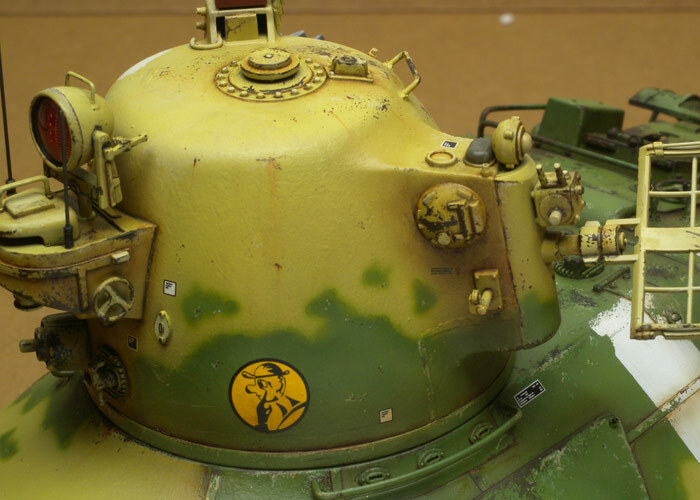 I was relieved when the white 3 decal lined up perfectly with the painted on black. 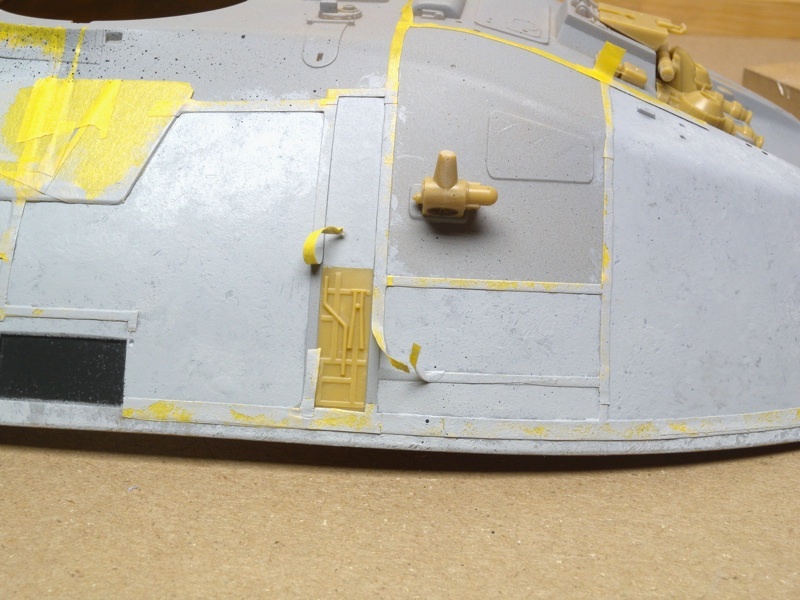 To add some variety, I masked off a couple of panels and airbrushed these a medium gray along with the side laser. 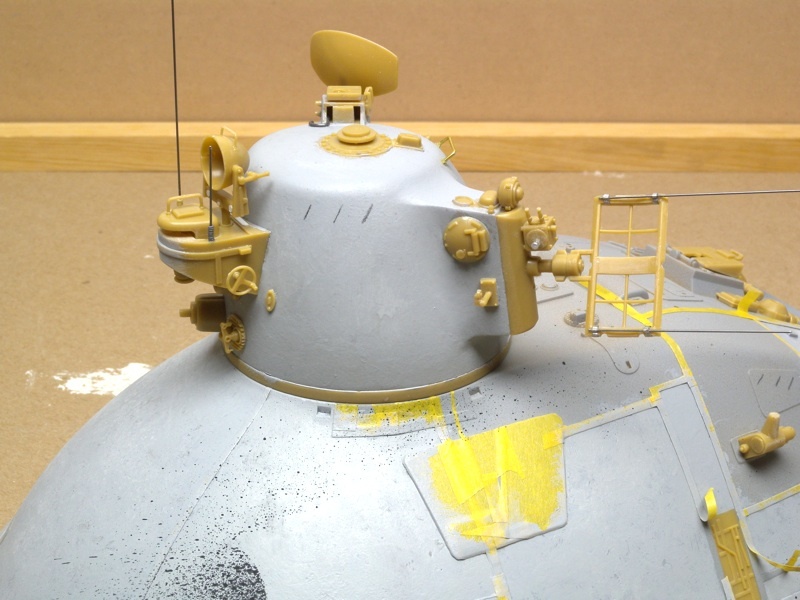 Weathering so far has consisted of applications of numerous filters either made from artist's oils or MIG/SIN Industries Filters. 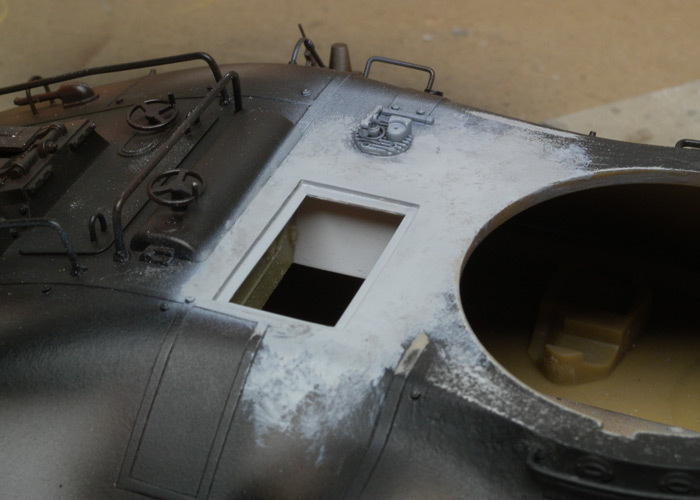 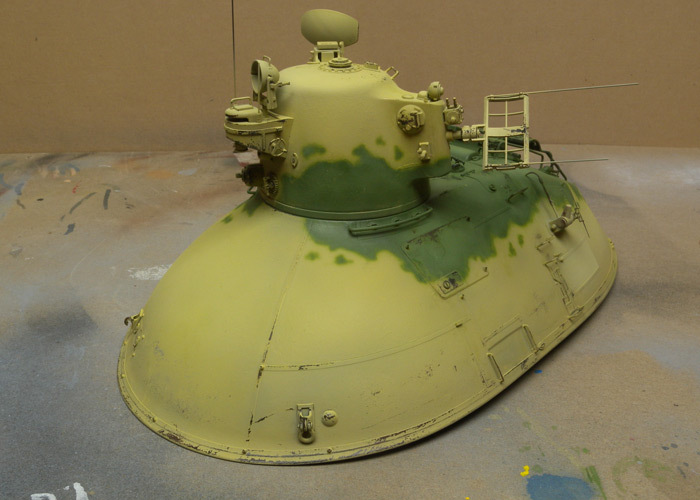 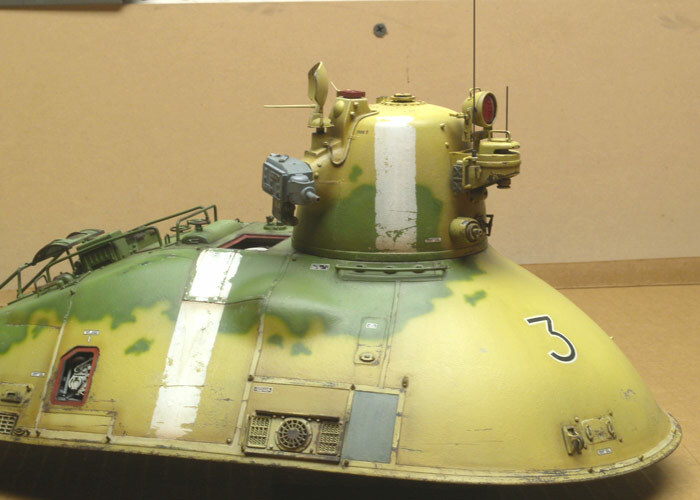 Vallejo Acrylic German Camo Black Brown was applied with a torn bit of foam or a 5/0 paint brush to add additional chipping and worn paint to accent panels, panel lines and maintenance wear. 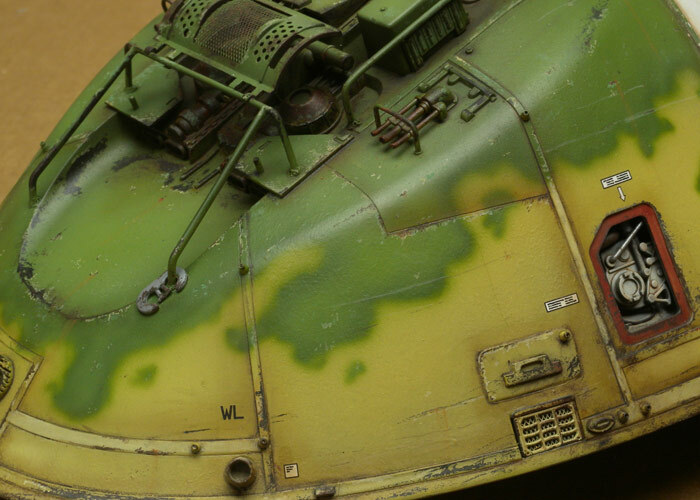 All colors were custom mixed to represent a different ages of the scratches. 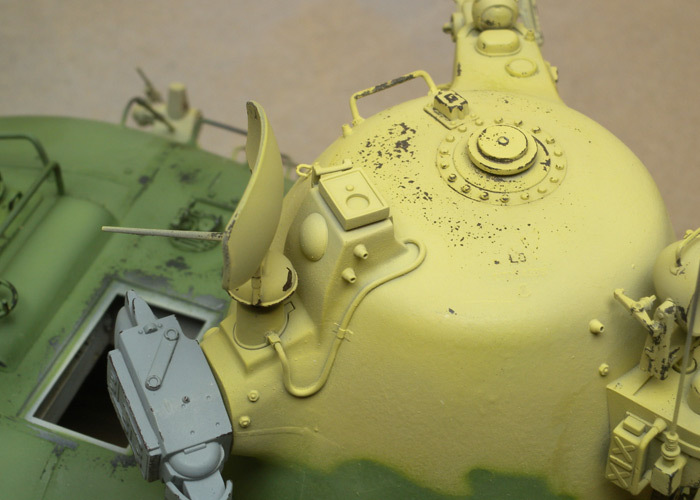 When the chipping was done, I used oil based washes and straight oil paint to accent panels and create general grease and grime. 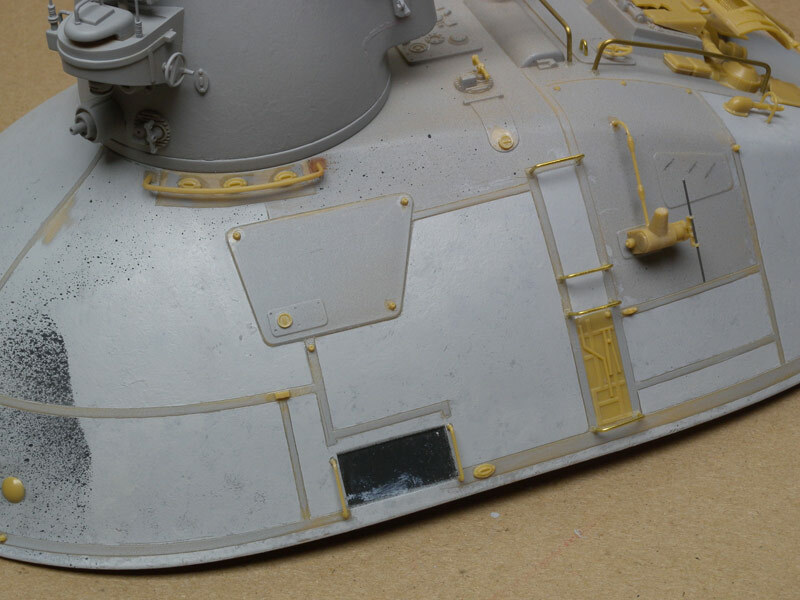 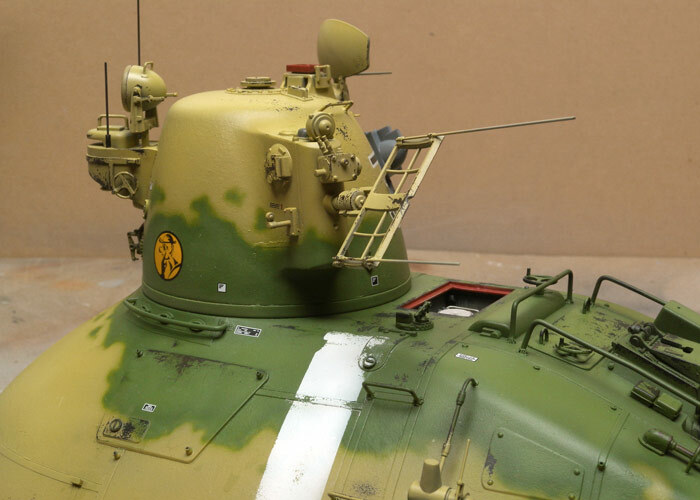 Additional weathering has been applied. 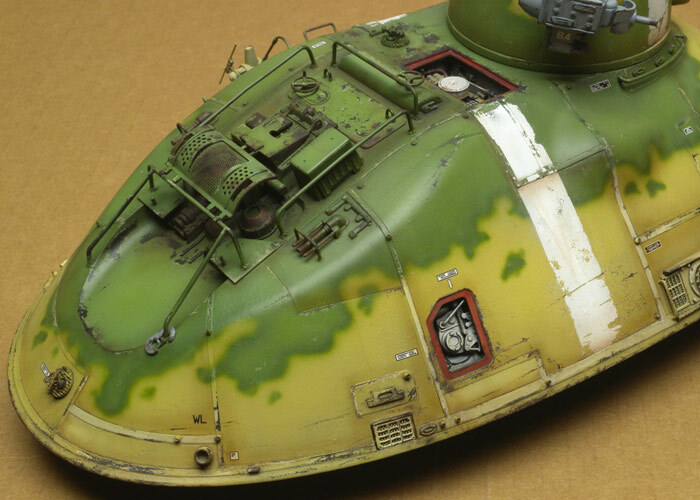 More chips, more washes and more grime. 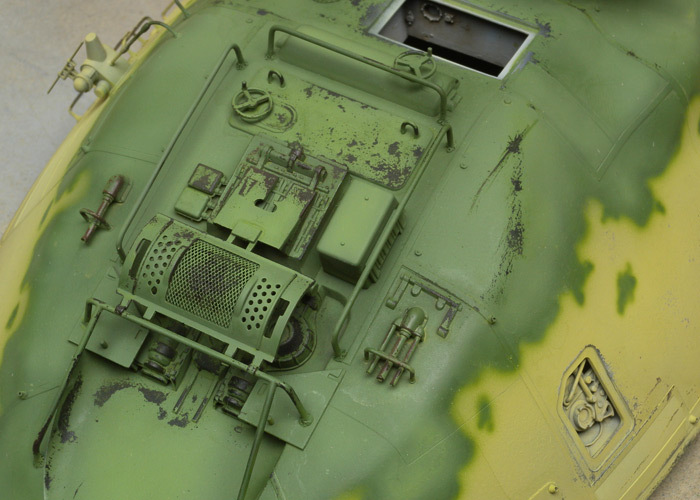 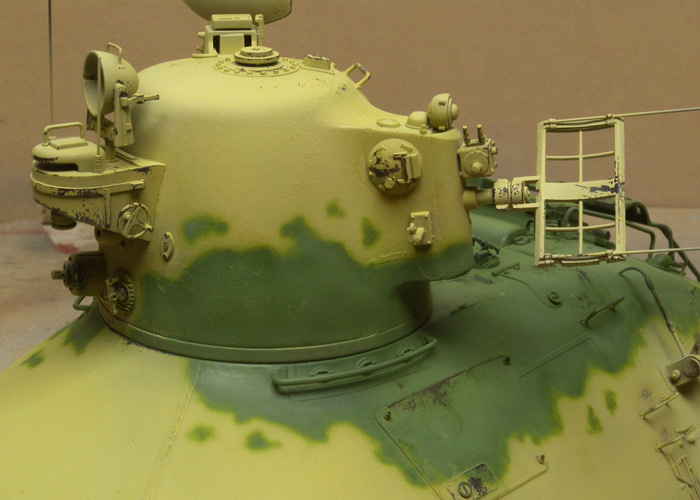 The weathering is building up slowly in layers. 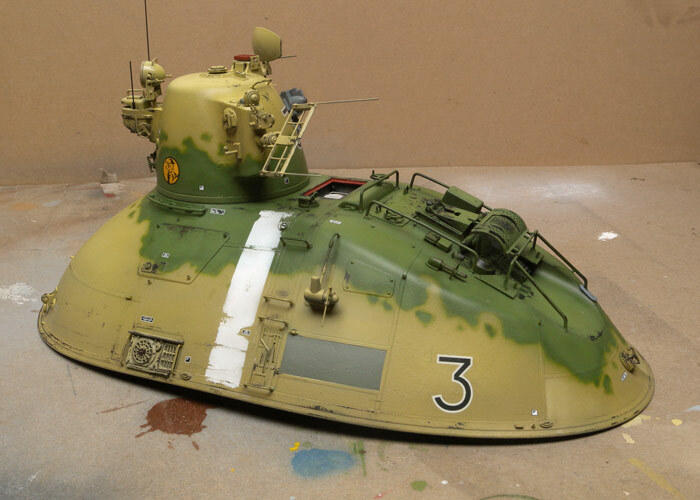 The model is just about done, but I wanted to post a few photos to see how it looks online which is always different than how I see the actual model. 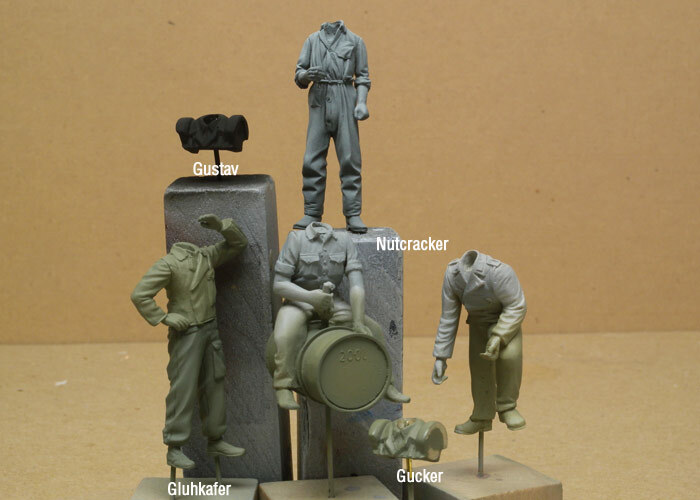 I've noticed a few things and have gotten some valuable input on tweaking up the figures. 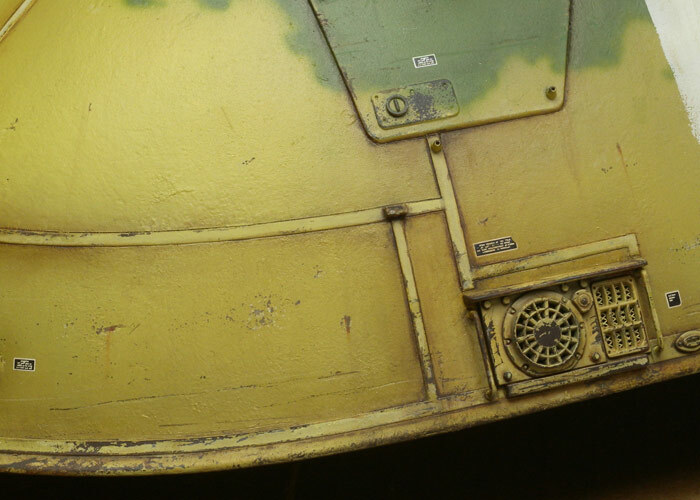 I think the yellow is closer in these latest images, especially in the close ups, but the wide shots are still too vivid. 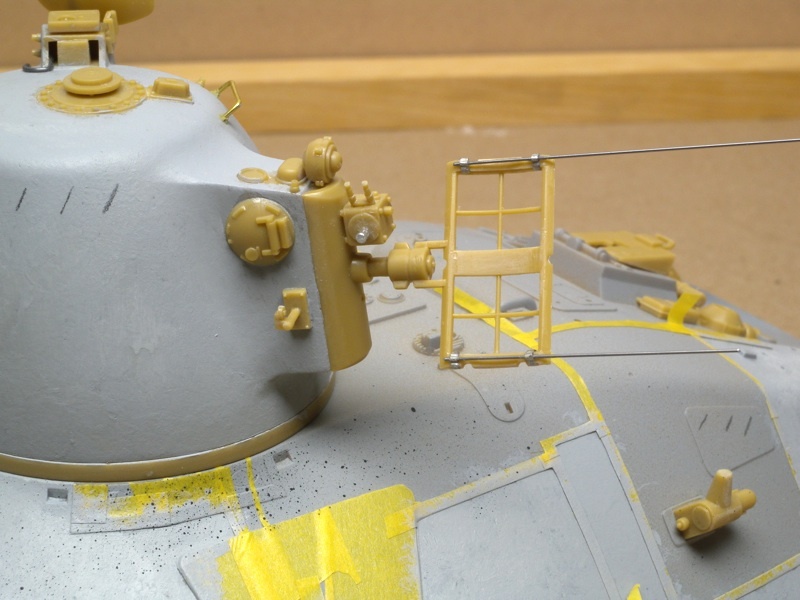 Even with a gray card, my camera wants to make the yellow far more vivid than it is so I've adjusted these in PS.